Stone Sheep have been on the top of my list since forever. For me, there is not a more beautiful or unique sheep on the planet. No two stone sheep look alike. 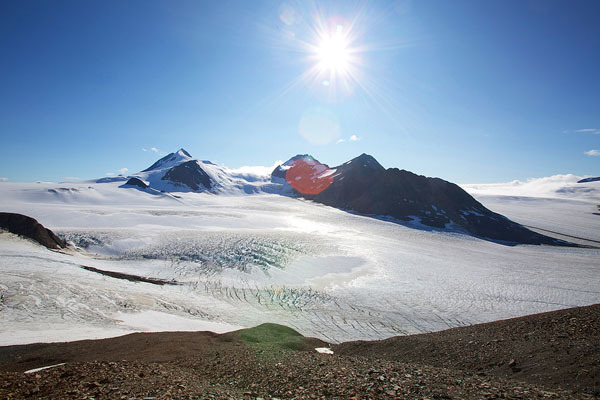 Plus they live in some of the most challenging mountains in the world with unpredictable weather. A perfect match to test your mind, body, and gear. 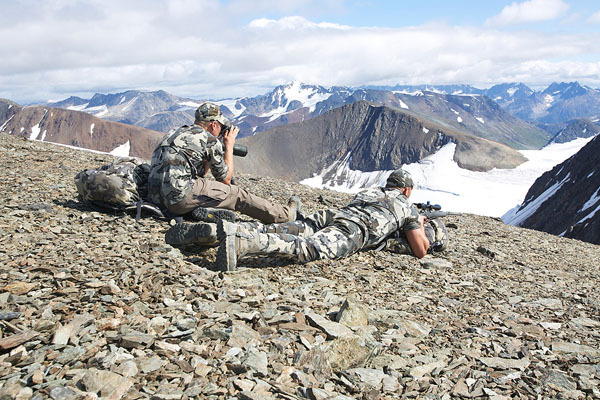 I booked my hunt with Golden Bear, owned and operated by Greg Williams, who has been outfitting sheep hunts for decades, and runs a top quality operation in a very good area for Stone Sheep, Mountain Goats, huge Canadian Moose, and Caribou. Greg’s son, Blake, is our sheep guide. 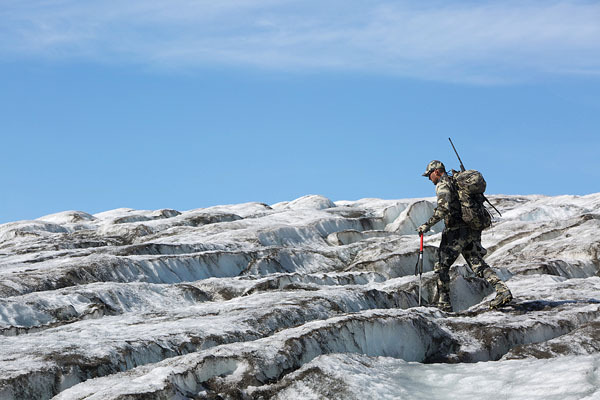 He has grown up working with his dad, running outfitting operations in the NWT and BC, and is an incredible guide with vast experience. His ability to spot sheep is absolutely next-level. 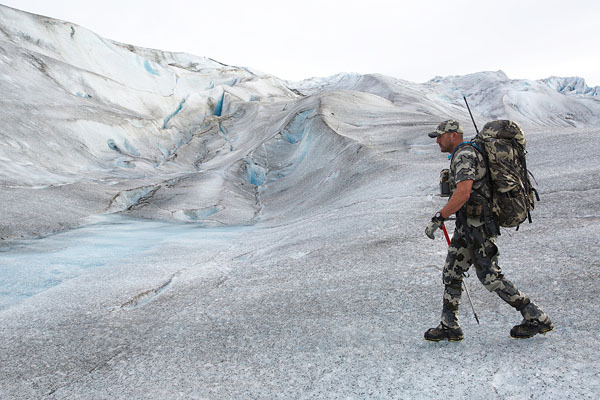 My good friend Brendan Burns, Director of Business Development and Guide and Outfitter Program for KUIU, joined me on my hunt to help spot sheep and hunt goats if he had the opportunity. 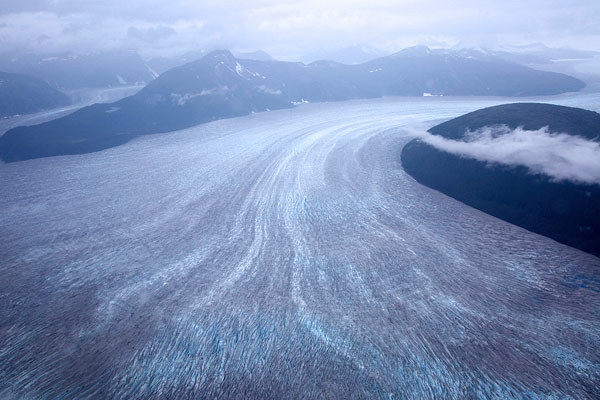 I met Brendan and legendary outdoor photographer Paul Bride in Seattle as we caught a connection to Juneau, Alaska. 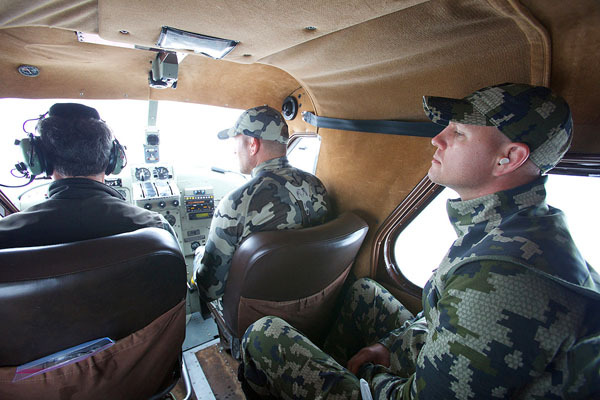 We spent the night in Juneau, and headed back to the airport the next morning to catch a 10:30am flight on an Otter on floats to base camp. ***All photos below are shot by Paul Bride. We arrived to the airport at 9am and are notified there is a weather delay. 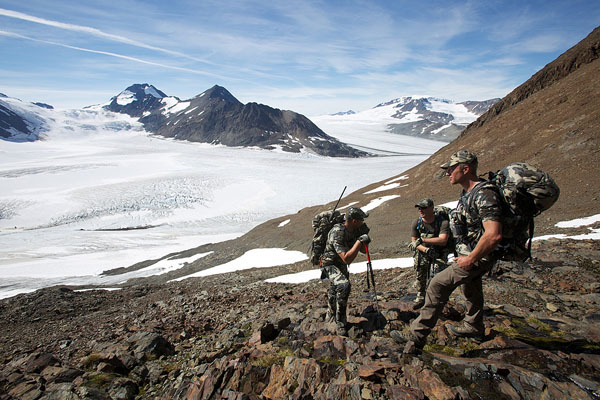 Hunting in BC and Alaska requires patience in getting into the mountains. We waited out the passing storm in the hanger. We recheck gear, clear customs paper work and waited the longest an hour and half ever before we are notified to load our gear. 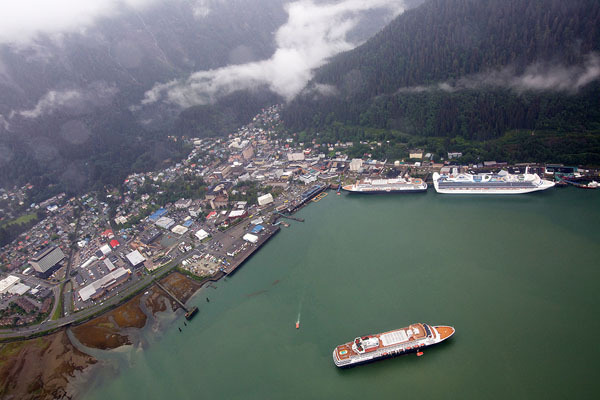 Juneau from the air, notice the Cruise ships at port. Stone Sheep country, from the Otter, breathtaking. 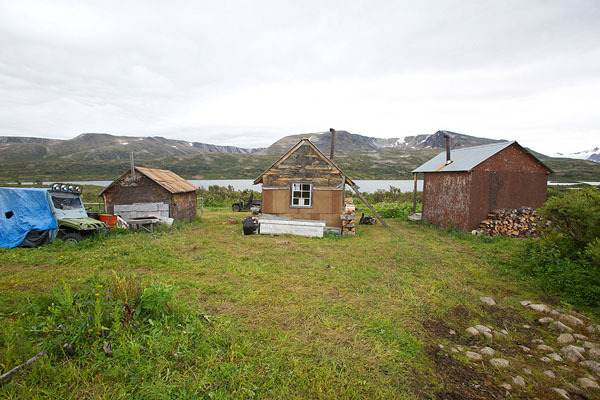 We spent the first night at the base camp cabins, which is hard with the anticipation of the hunt in front of us. 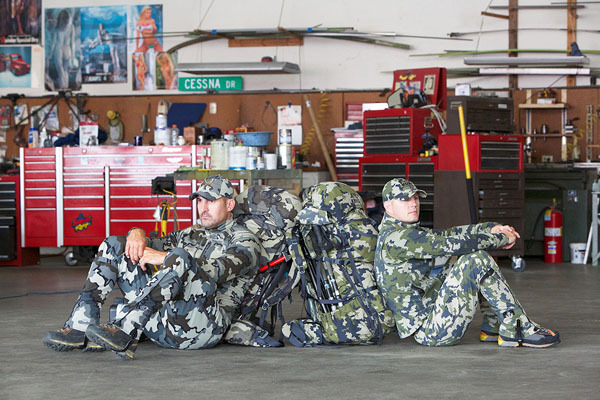 We organized gear, reviewed maps and discuss the plans for the up coming week. 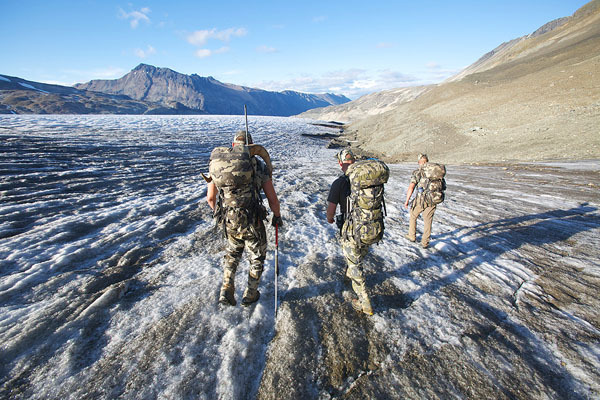 Greg and Blake are taking us into an area they have not hunted in four years; a mountain completely surrounded by glaciers that historically holds rams. The access to this area is challenging (understatement), which limits the clientele they can take in there. 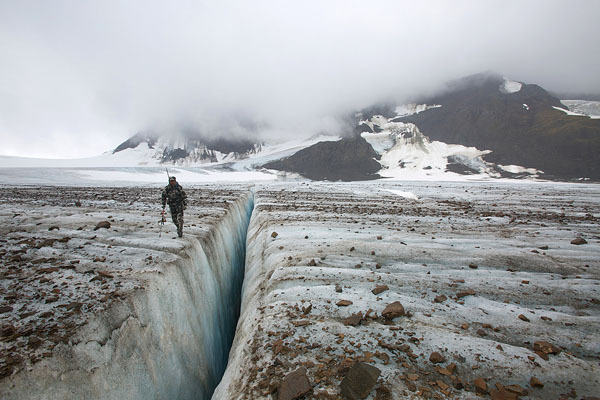 I was really excited about the challenge this rock-and-ice country would throw at us. 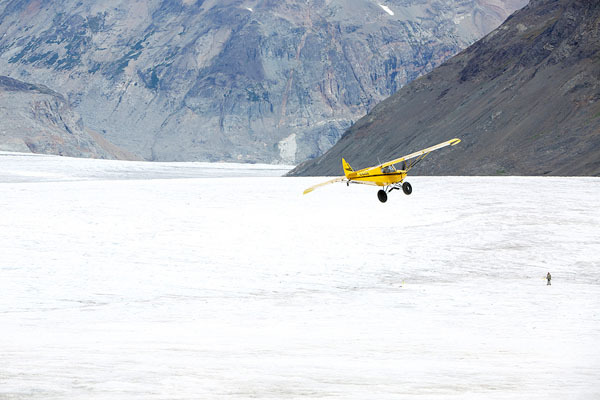 The next morning, Greg flew us from base camp to a gravel bar ten-plus miles below “Ice Mountain” in his Super Cub. Like father like son, the apple did not fall from the tree with the Williams! A couple of the greatest people you will ever know. 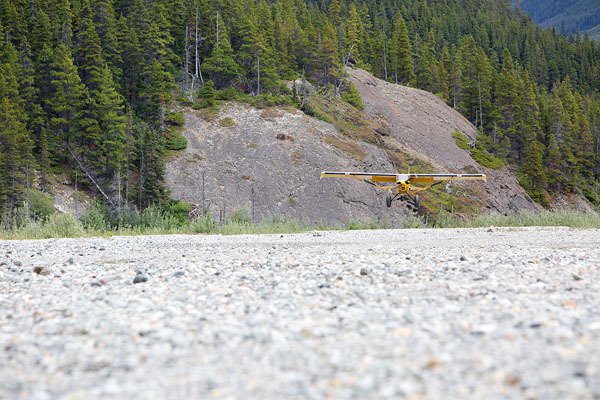 Greg setting down his Cub on the gravel bar. 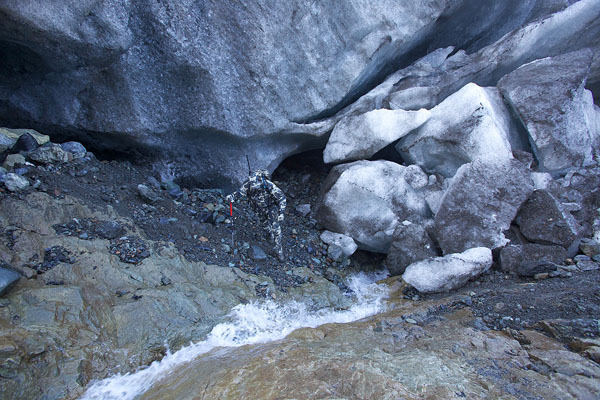 You definitely get your minerals drinking Glacial Water. 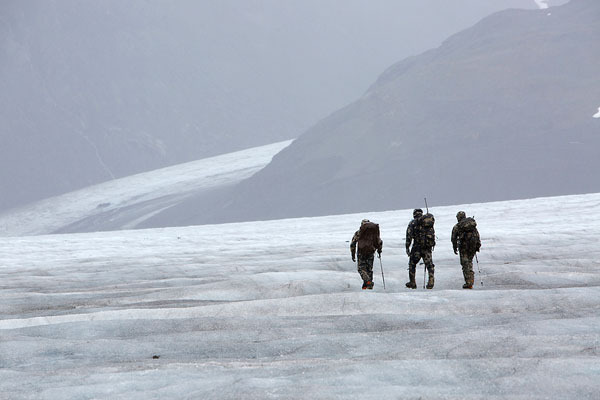 We had a full day of hiking up the drainage and onto a glacier. 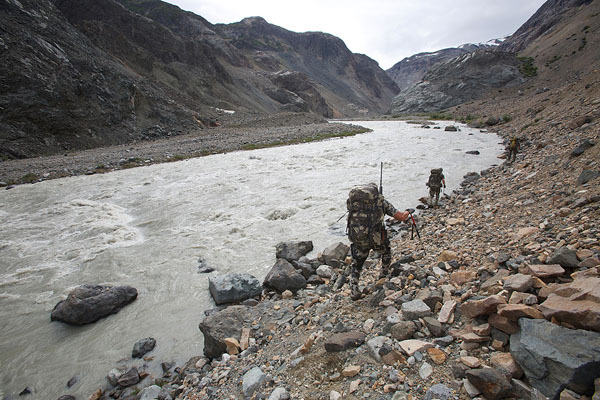 Fully loaded down with gear and food for the hunt it was long and challenging day in the pack. 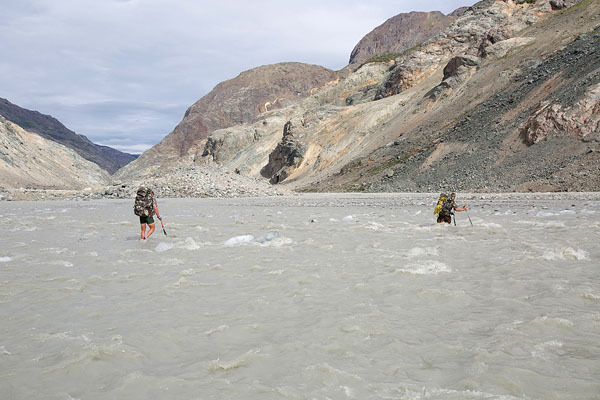 It took us through a range of terrain, from river bottom to river crossings, vertical terrain to glacier travel. Dodging the ice tumbling down the river was a bit unnerving. It certainly kept you moving quickly. 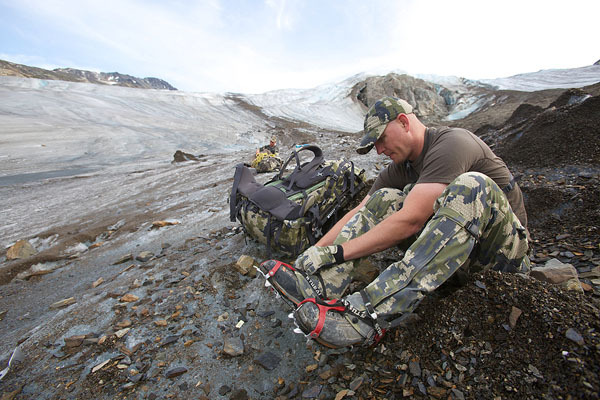 Crampons and ice add a whole new experience to a sheep hunt. 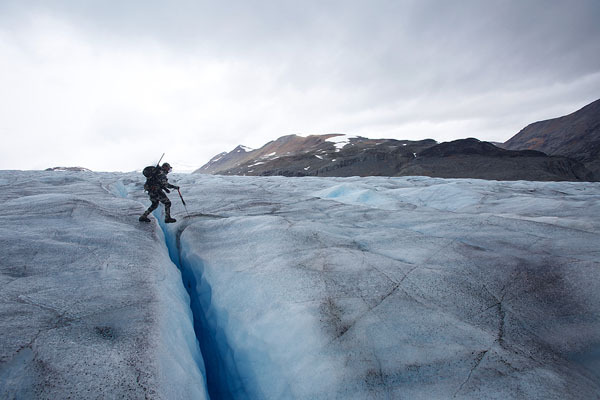 The big crevasses will get your attention. The thought of falling in one is mind-numbing. 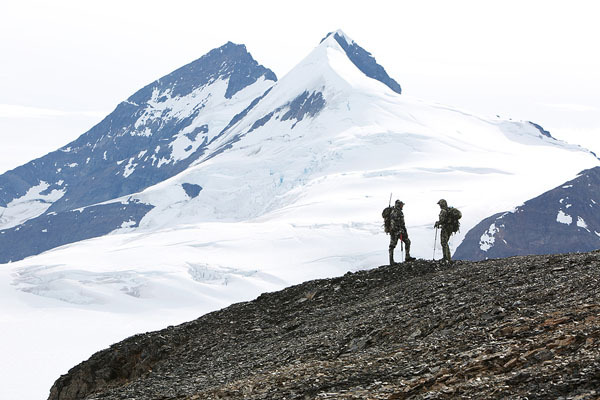 Blake spotted a band of rams on Ice Mountain. We got behind our glass trying to get an idea of how big the rams are in this band. They were still too far to tell anything other than we were looking at a good band of rams. 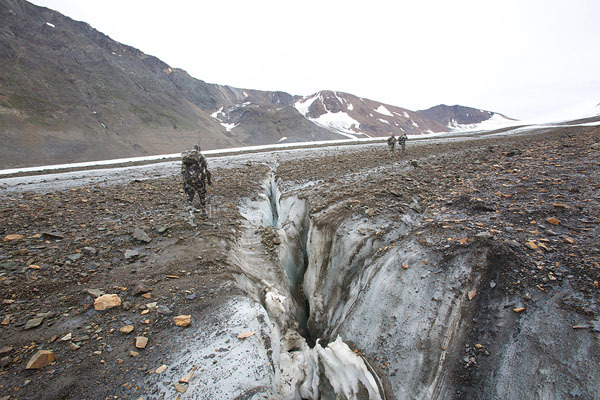 We set up camp on the only flat spot in this glacial drainage. 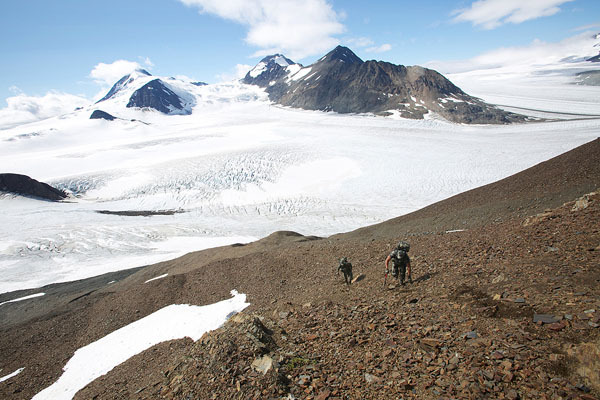 We pitched our tent on an exposed glacial moraine. 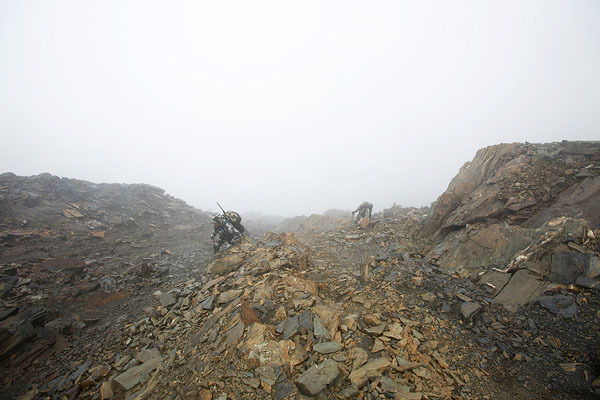 Pitching tents that will get pounded by wind in sandy ground required us to use boulders to insure they held. We also built boulder walls on the upwind side of our tents for added security. 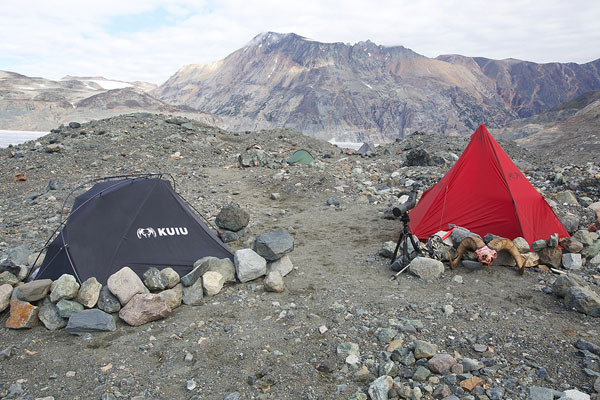 My shelter is a new single-pole prototype tent that weighs just over a pound. 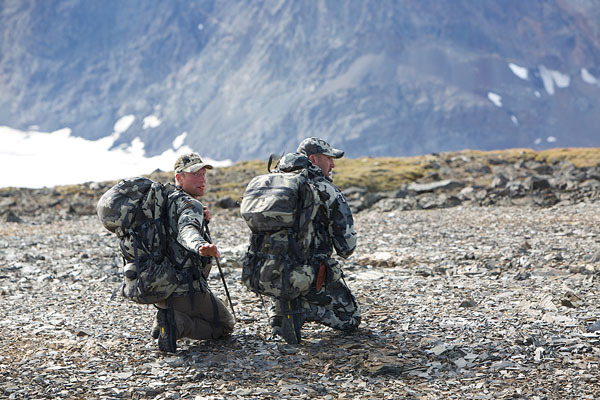 This hunt would put it to the test. We made our daily dinner of Mountain House, and discussed tomorrow’s plan. The rams have us up early trying to determine if there was a big ram in the band. A light colored ram had our attention but was still too far to judge. 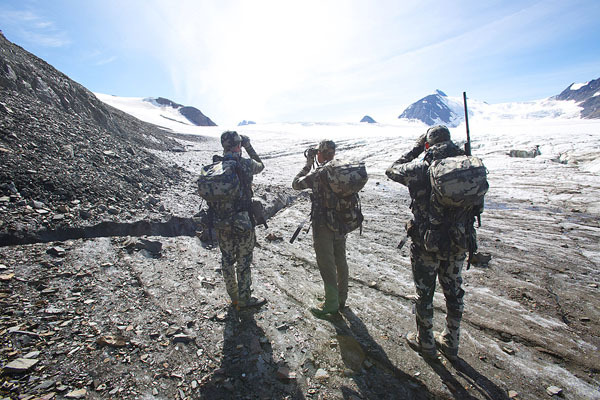 Shortly after putting the spotting scope on them, the rams fed over the ridge and out of sight, which was exactly what we needed to cross the glacier to the mountain. Two young rams we ran into during our stalk. I am sure we are the first humans they have ever seen. We work our way to the bottom of the ridge we last spotted the rams. They are bedded above us on a bench; out of sight. We had to sit tight and wait for them to get up and feed. 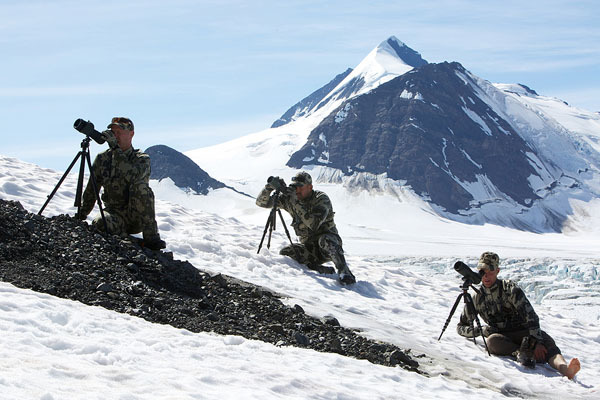 Two hours later, they finally fed over the ridge, and we were able to put the scope on the band. There were two legal rams, and the lighter of the two was an absolute stud. We ended up calling him “Twister” because his horns went past full curl and his lamb tips twisted back down. This was by far the most impressive ram I have seen on five sheep hunts. With the rams above us and in the open there was nothing we could do except watch and wait for them to give us a chance to make a stalk. 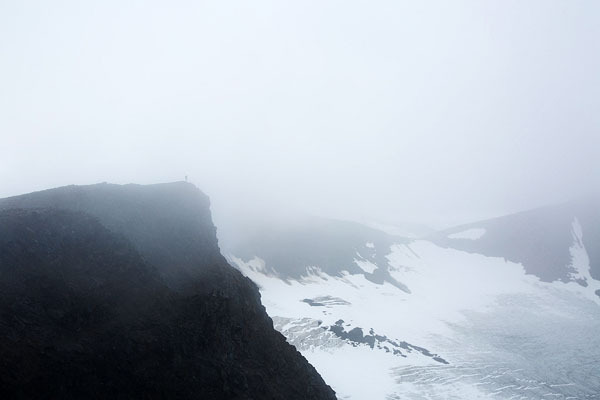 There were cliffs above them and on the right side, so our only option was to come at them from directly below which would prove almost impossible. 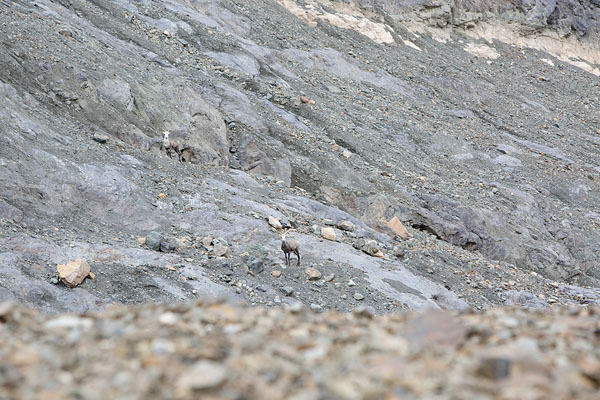 Two smaller rams bedded in the rocks on the skyline above. We are pinned down for hours and there was nothing to do but be patient and wait out the sheep and the storm that rolled in. After several long hours the rams got up and finally fed out of sight. 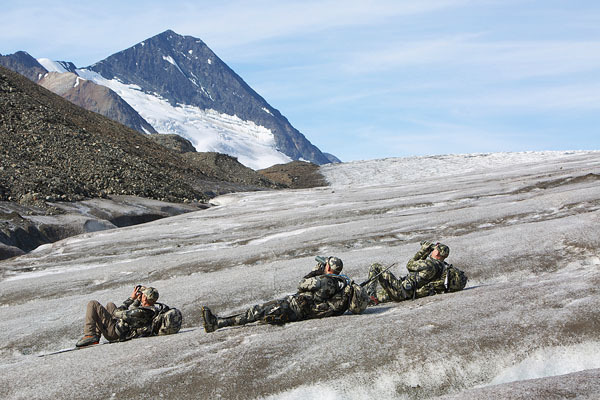 We quickly made our move straight up the ridge. We relocated four of the seven rams. The Twister ram and two other rams vanished! 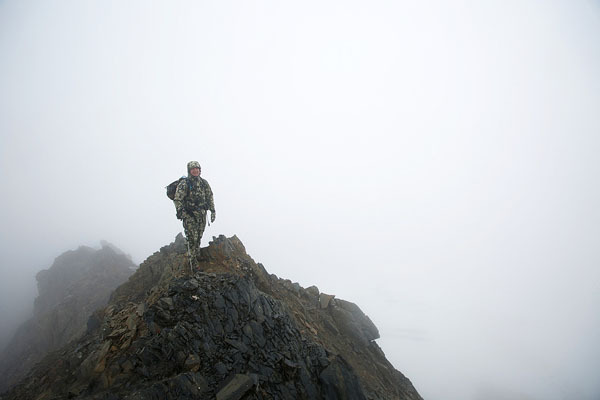 It was hard to believe he was just 700 yards above us at one point and now was gone. What a heart breaker. The Four rams we left on the ridge the night before were again feeding on the skyline this morning. Twister was not with them, nor his two friends. They were still missing. Since he was not on the frontside of the mountain, we were hoping Twister had fed up and over the top and was in a backside drainage or cut. 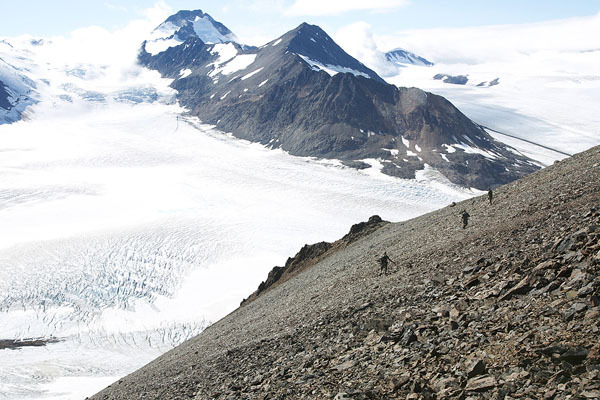 We drop down and around the mountain, slap on the crampons and head up the glacier along the backside of Ice Mountain. 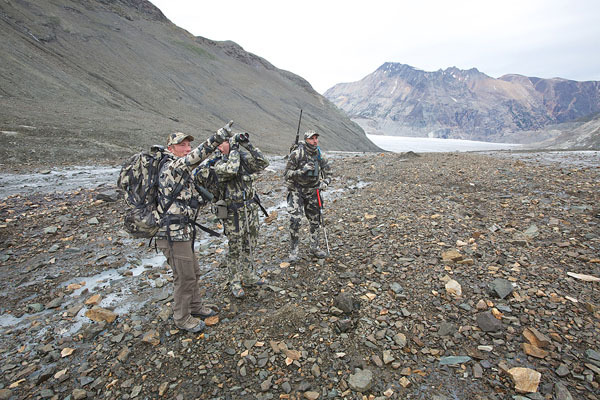 We took most of the morning slowing glassing and moving in search of the big ram. 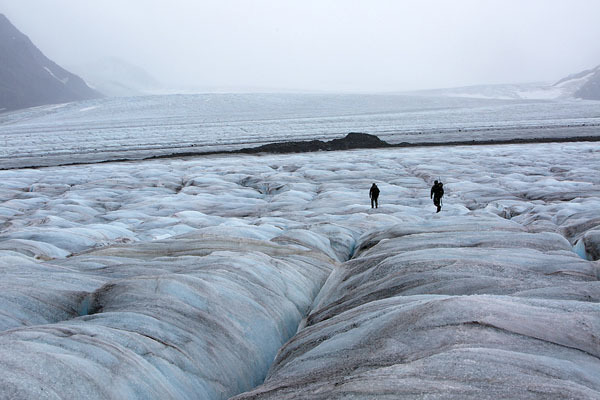 We had to be very careful not to be caught out on the ice which gave us no cover to the country above us. At about 1pm we spot three rams on the ridge in the distance. We closed the distance and put the scopes on these rams. These were three different rams; no Twister. One of the three was a good ram but too young to consider. 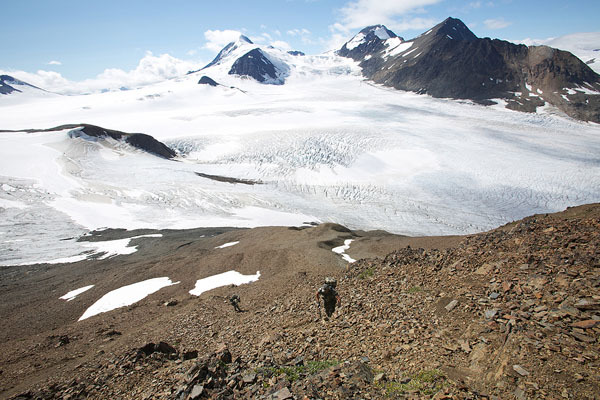 We continue up and around Ice Mountain to a tucked away basin near the back of the mountain. 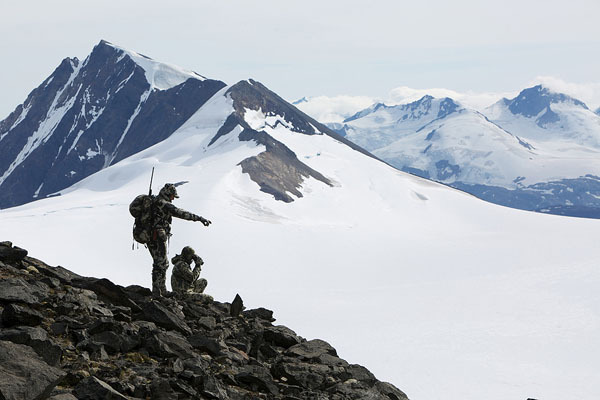 It was a great looking spot for sheep and Blake quickly spots another band of rams up high on a ridge. They were feeding over the skyline and we could not get a good look at these rams before they fed over. We were pretty confident Twister had to be in this band. 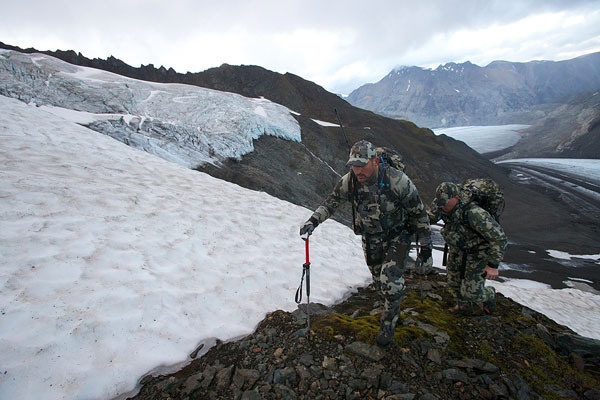 We put a plan together for the stalk that included a long climb up to the the saddle below the rams to stay out of sight and keep the wind in our favor. 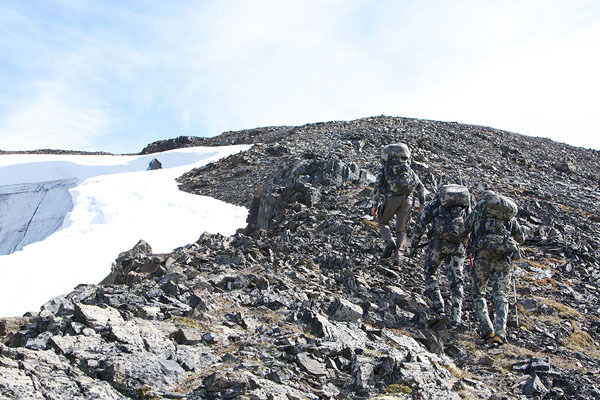 We climbed up to the saddle and followed the rams up onto a large round mountain top. 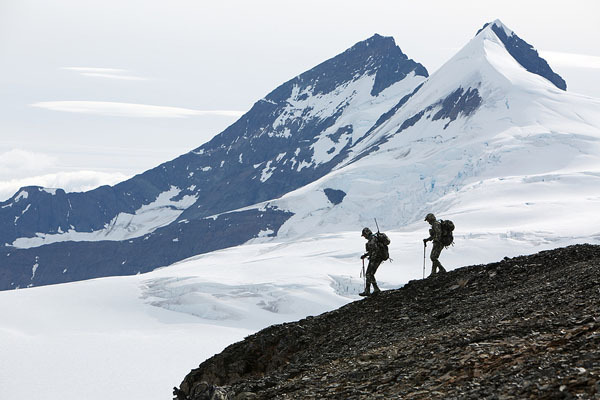 We searched the top of the mountain for the band of rams. 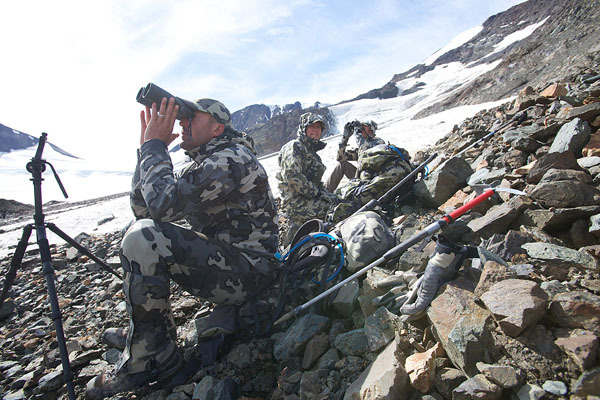 It took us over an hour of slowly working our way around the mountain before Blake spots the band of rams at only 100 yards. They were bedded facing away and the wind was blowing hard in our faces giving us the perfect opportunity to close the distance. 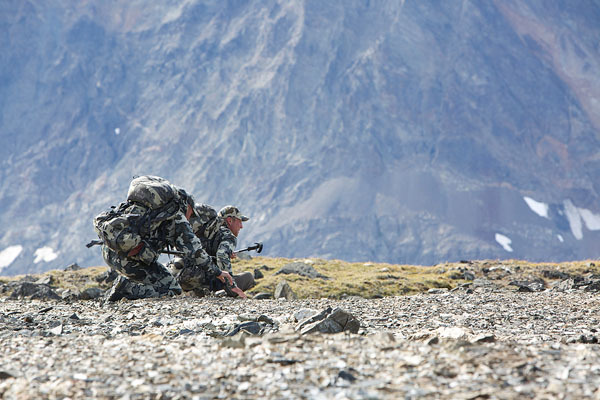 We are really close, we have a small ram at less than 40 yards just over the grassy ridge in front of us. The other rams are all laying just beyond. We sit tight, waiting for the rams to get up. After a few minutes the rams got up to feed. We quickly look over the band of rams and realize Twister was not one of them. There were two legal rams and Blake pointed out which of the two was the best one. I took aim, and was holding on the ram’s chest, he less than 40 yards away. I waited for the “green light” from Blake. He whispers to me that he is a good ram, but not Twister and to pass on him. We watch them walk off. What an experience to be so close to these rams. We spent the rest of the afternoon glassing and searching for Twister and his buddies. No luck finding him, but what an incredible day! At 4:00 AM, a storm front moved in that kept us tent-bound due to very heavy winds and rains that pounded us for six hours. The wind gusts were so strong I had to lean up against the back of my tent to help hold it down. At 10:00 AM the storm let up a bit, and we assessed the situation. The high mountains were cloud-covered and would not let us glass for sheep. 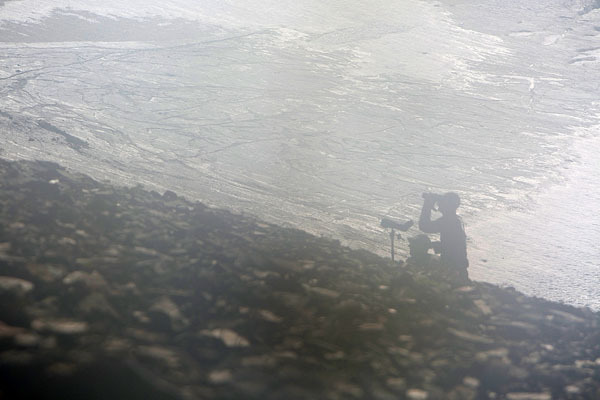 Across the large glacier from camp, Blake had been watching two big mountain goats for the past 3 days. 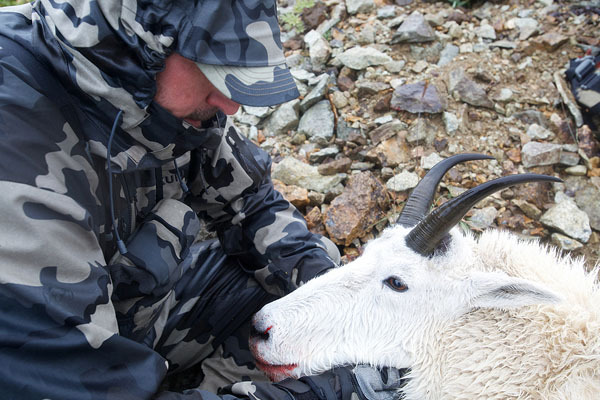 With the high country weathered in we loaded up our gear and put a long stalk on these goats. 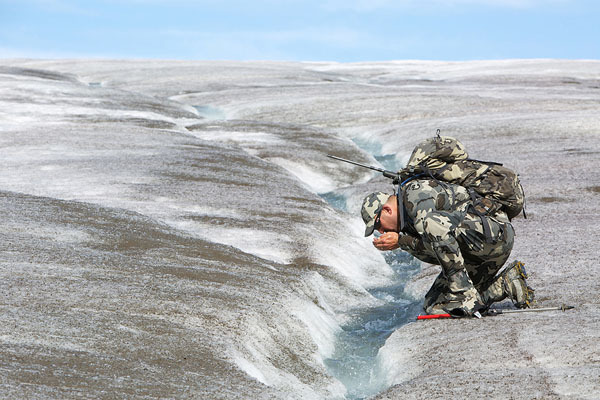 The two Billies were feeding in two different areas above the glacier. Our plan was for me to make a stalk on the first goat, and if successful, Brendan would make the stalk on the second. 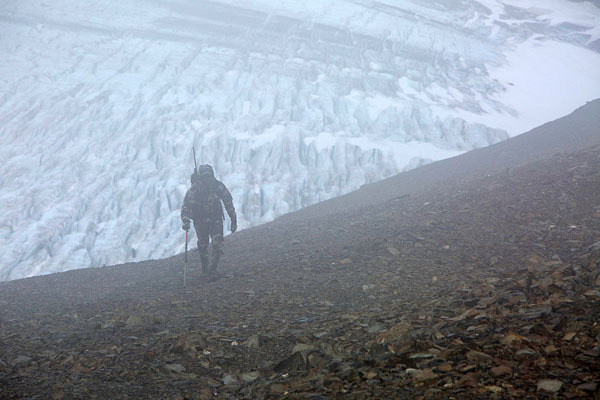 As we crossed the glacier the next wave of the storm set in with another heavy dose of wind and rain. The wind and rain became so intense you had to keep your head down to avoid the sting of the rain hitting your face. 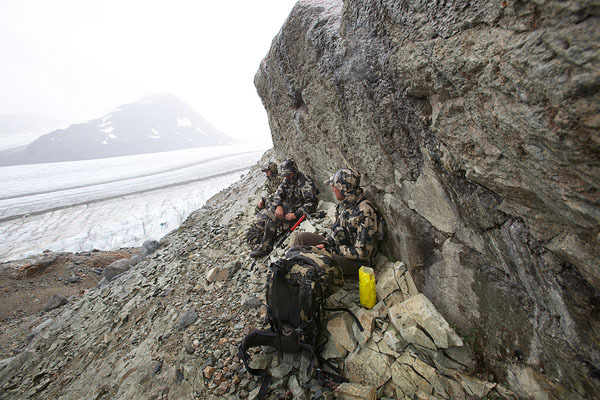 We took an opportunistic lunch-and-weather break under this small cliff to get out of the pounding weather. We close the distance on the first Goat. Were not exactly sure where the billy was, as usual, everything looks different once you close the distance on the stalk. We crest a rise and accidentally bump into the Billy at close distance in the storm. I tried to get a shot on him but could not in the heavy rain and wind before he got over a ridge. Now we moved on to plan B and make a stalk on the second billy. We close the distance and then slow down and carefully search for him. We do not want to make the same mistake on this goat. 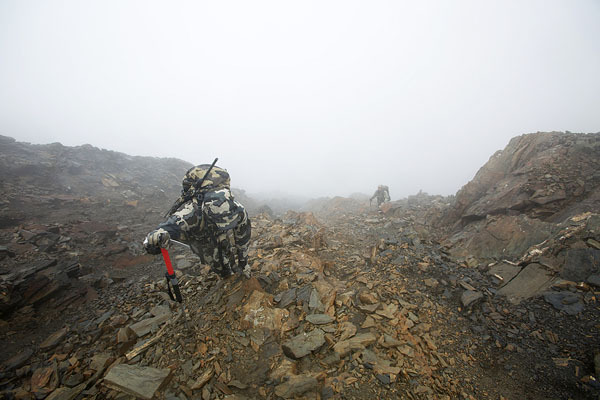 I peak over a small ridge and below us at 200 yards I spot him in his bed. He saw me at the same time and took off on a hard run. We did it again! This time I quickly throw down my pack and set up for the shot. The wind and rain a absolutely pounding us. 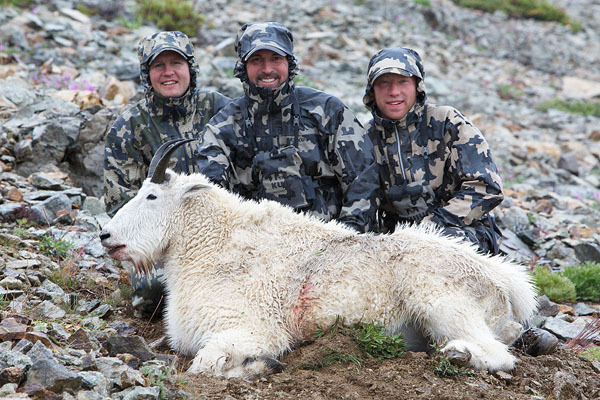 Blake calls out “300 yards” I find the white body of the goat in my rain soaked scope and squeeze the trigger. 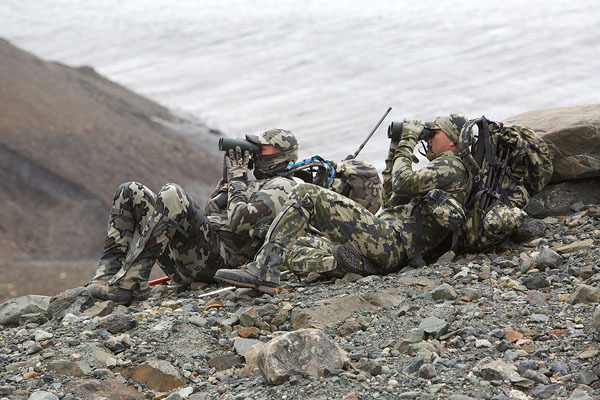 The big Billy seems unfazed, I quickly work the bolt and find the white in my scope, put the crosshairs on what I believe is his chest and squeeze again. 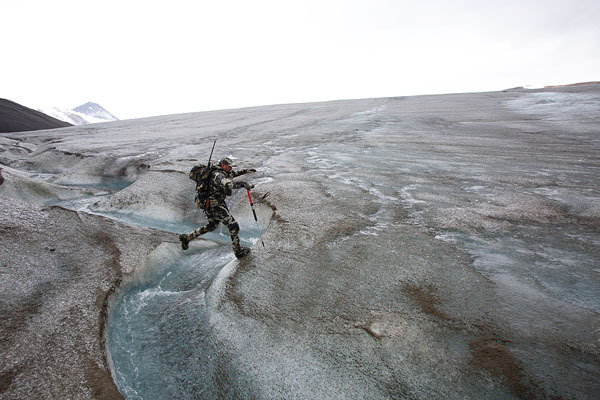 At the shot he moves down the hill, but we cannot tell if he is hit. It is too windy and the rain is pounding us so hard it is difficult to tell what has happened. Then we see him bed down and at that time realize he was hit. Two shots through the chest. What a tough animal! 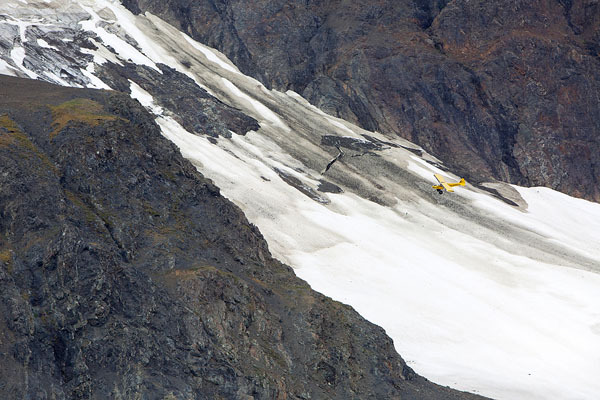 If Mountain Goats were not white there was no way I would have been able to make this shot in these conditions. 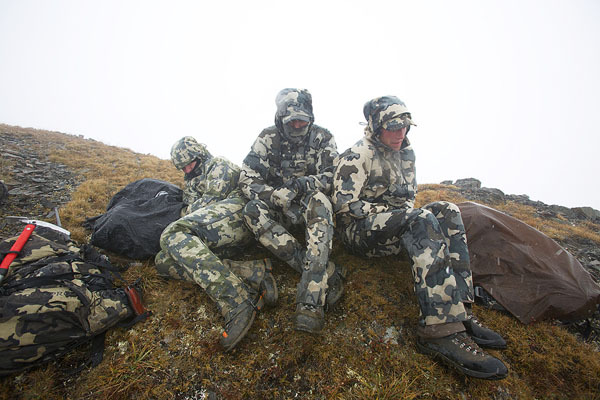 By far the worst weather conditions I have ever hunted in. This was a heck of a billy with 9 ½ horns and good mass. I could not believe how big his body was. Much larger than I ever imagined a mountain goat would be. I was totally thrilled! We were now totally focused on finding Twister. 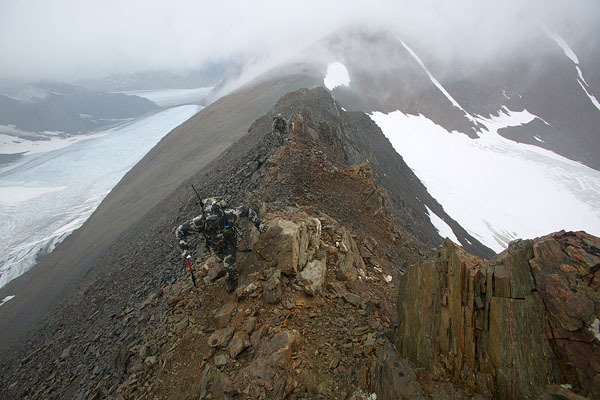 Blake plans a full day search into an adjacent basin, and out a long ridge to see if we could find him. 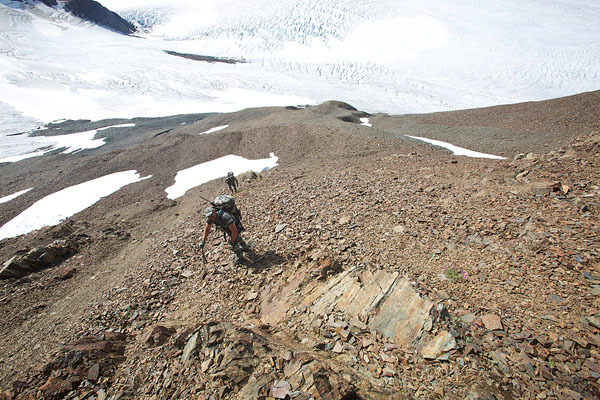 It was one of the most physically demanding and technical climbing days I have had in the mountains. All done while a huge storm and heavy winds pounded us, testing our gear, bodies, and minds. 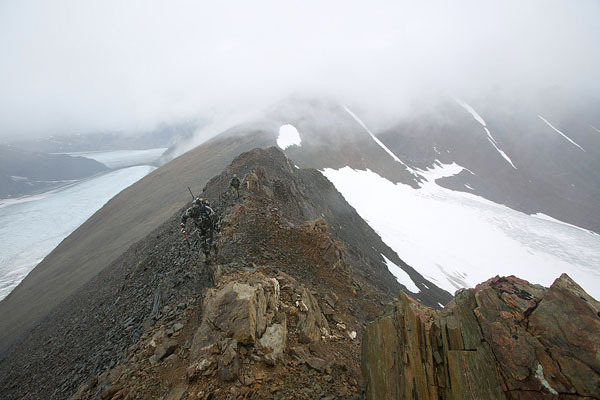 This ridge ascent was scary. 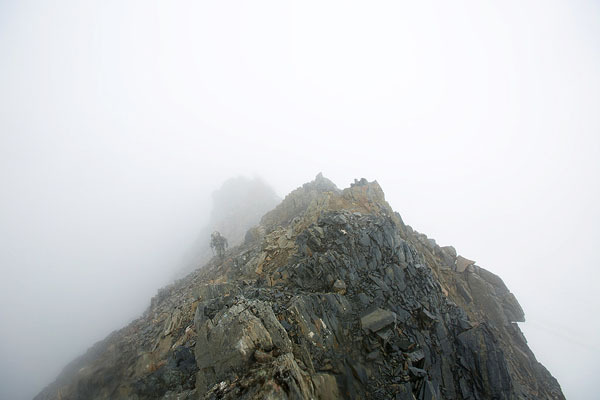 The photos cannot show just how vertical this terrain was. Literally straight down and to make matters even more challenging was the loose and crumbling rock we had to climb through with 50 MPH winds, rain and snow adding to the experience. The top was a complete sense of satisfaction, except the realization that we had to decend the ridge later that afternoon. I could not get that out of my mind all day! Once on top the storm hit us full force. We could not see more than 50 yards, so we hunkered down waiting for the storm to break. Eventually the wind became so strong we had to seek refuge behind this small rock outcropping. After a couple of cold wet hours the storm breaks and the clouds lift. 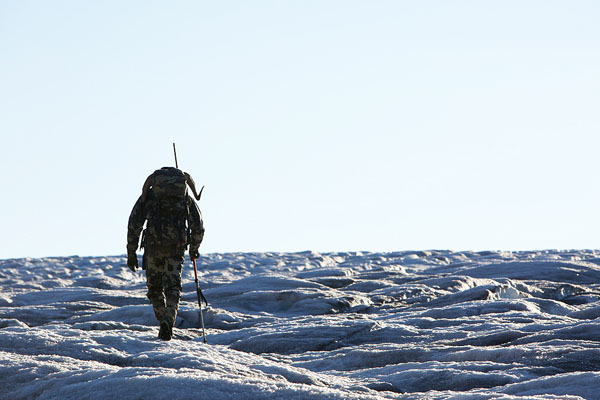 We hunt down a long ridge that is covered in sheep beds, tracks and sign but no sheep that day. At the end of the ridge we finally spot a band of ewe’s and lambs, but no rams and no Twister. The only option at this point was to search the back side of the mountain again. The weather has finally cleared for a beautiful day. Paul tells me today is the day. I have a similar feeling as we loaded up gear for the day. 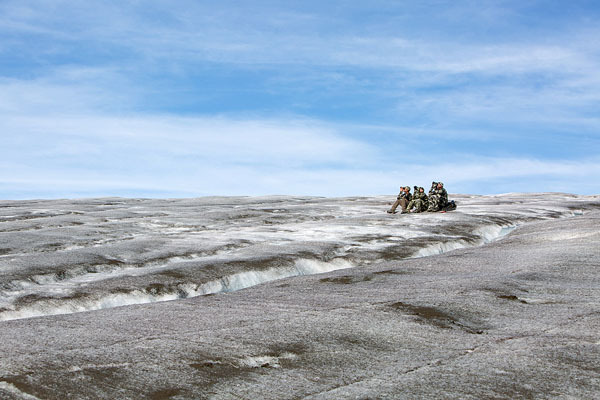 We strapped on the crampons again and hit the glacier. 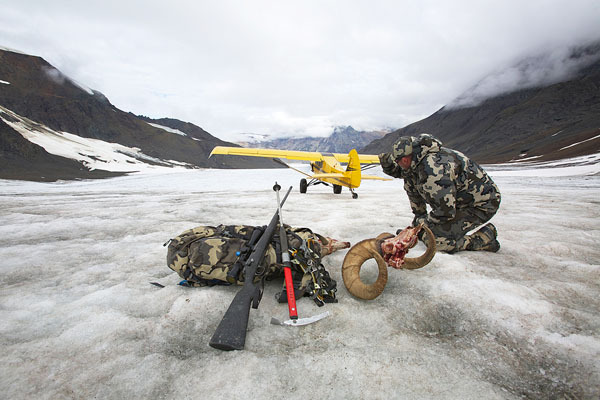 After several hours carefully glassing and moving along the backside of Ice Mountain we finally locate rams. The are in the same high basin we passed up the rams on day four. We were optimistic Twister had joined this group of rams. They were bedded when Blake spotted them and shortly after, they got up and fed up to a high saddle. Blake and I discussed the opportunity. If Twister was not in this band, Blake suggested I should consider the ram we passed up on day four. He was the second best ram we have found and our options were getting limited in this area. 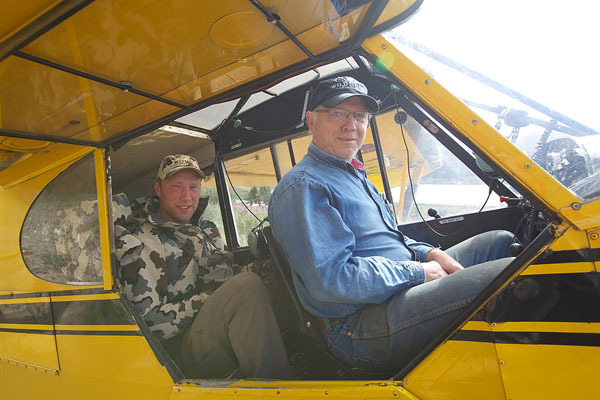 The only other option was to have Greg fly in and move us to a new area. Blake’s concern was running out of days. Moving and starting from scratch was really risky. 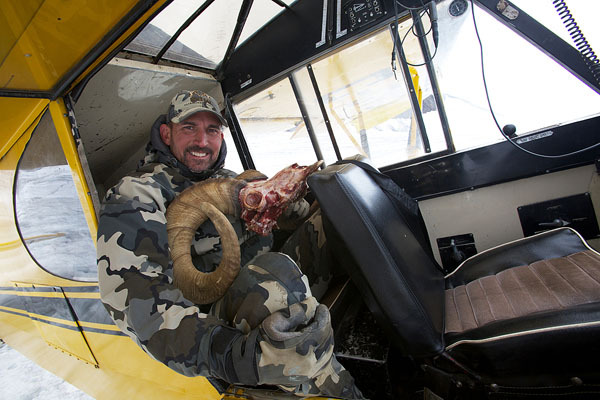 There were no guarantees that we would find a ram larger than this ram before my hunt ended. It was an easy decision, if Twister was not in this band, I would try and take the other ram. We had to get above the rams to get into postion for a shot. 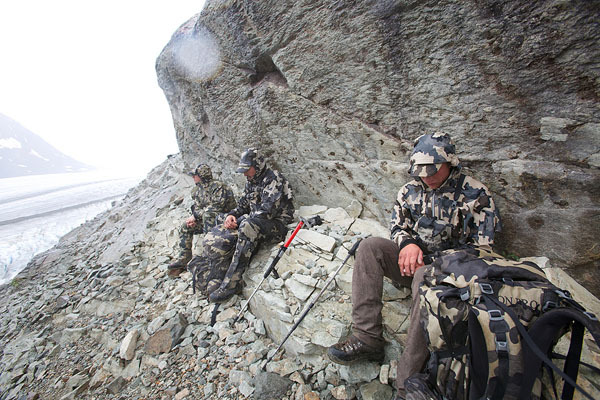 Our only option for the stalk was 3000 vertical feet straight up. Up we went! What a beautiful day to hunt sheep. It was by far the nicest day of our hunt. 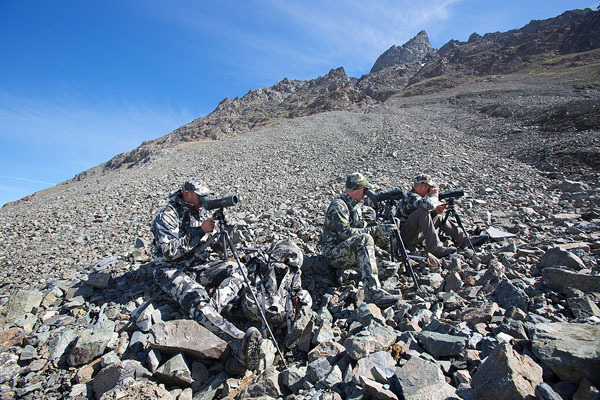 Once we got above the rams, we closed the distance and found them bedded in the saddle below us at about 250 yards. We could not see the entire band, so I set up for a shot and held tight. After about 30 minutes a good ram got up and fed right to us. He stopped at 50 yards, I held on him, waiting for Blake to give me the green light. He told me to pass on this ram. Too young. After staring at us for five minutes the ram finally spooked and took off across the ridge to the right with the other rams. We quickly followed to get a look at the rest of the rams. The last ram that came out was not Twister, but the other ram we passed up on day four. Blake told me to shoot this ram. He came out below at 200 yards I set up and shot and he was down. What a rush! I could not believe I had just shot a Stone Sheep. I quickly descended the 200 yards to get my hands on my ram. I could not stop shaking with adrenaline. Stone sheep are beyond all of my expectations. I sat with this ram just admiring the beauty and looking around at this spectacular country. This was a very rewarding hunt that truly tested me mentally, physically and emotionally. 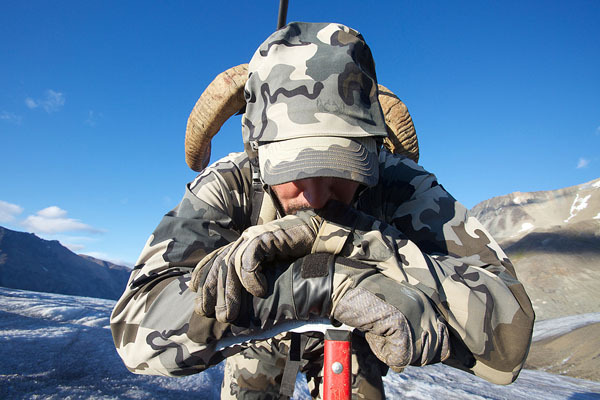 The ram I harvested is a symbol of a life dedicated to mountain hunting, the equipment needed to perform in extreme conditions and physical conditioning to survive and enjoy such an adventure. I could not be happier with the results. This ram is absolutely beautiful. He is 91/2 years old, 36″ in length with 12 5/8″ bases. His coloration is a mixture of light grey and dark grey and he had a beautiful blue hew to his coat. What an incredible animal. 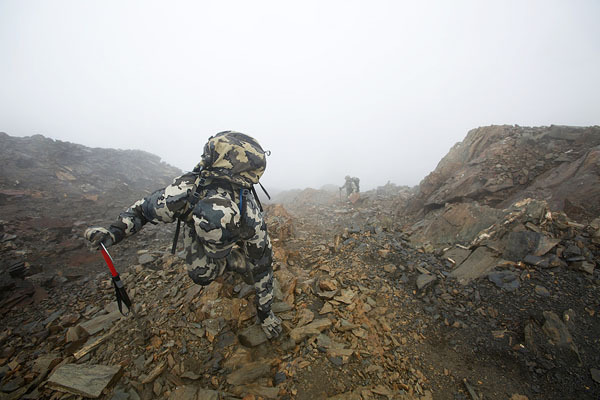 The Mountain Star’s and new Ultra Star Prototype were severely tested on this trip. The performed flawlessly. There is nothing better than this type of gear testing to find shortcoming in gear. 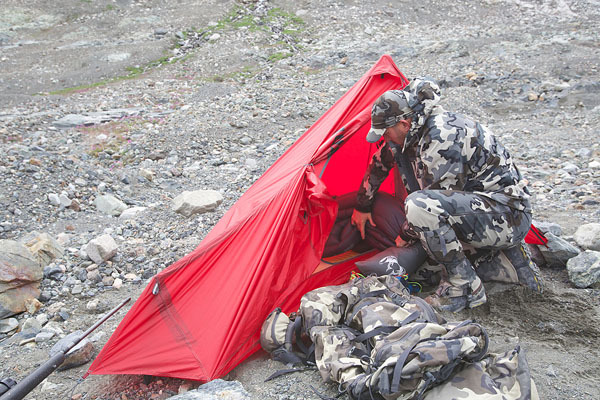 This new Ultra Star prototype tent proved to be storm worthy in some of the worst conditions I have experienced. 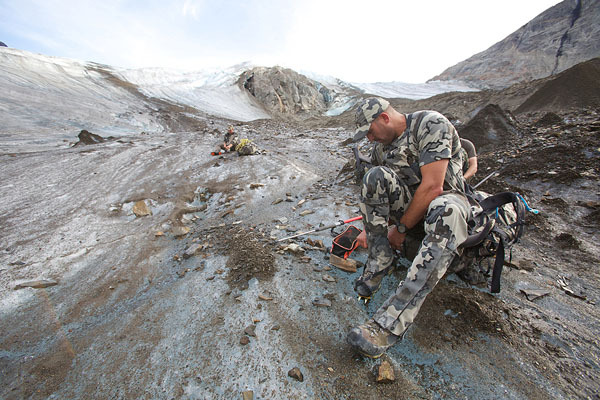 We spend the next day fleshing the coats and moving meat up onto the glacier for pick up the next morning. 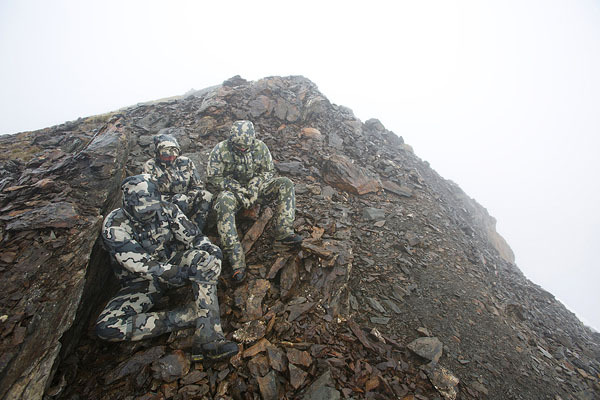 This hunt was the most physically and mentally challenging hunt I have been on in 35 years of mountain hunting. 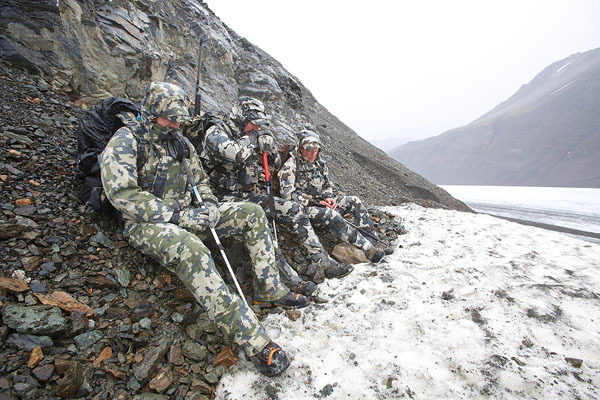 The weather, glaciers, steep and rocky terrain and the sheer difficulty involved in spotting Stone Sheep made this an incredible hunt. 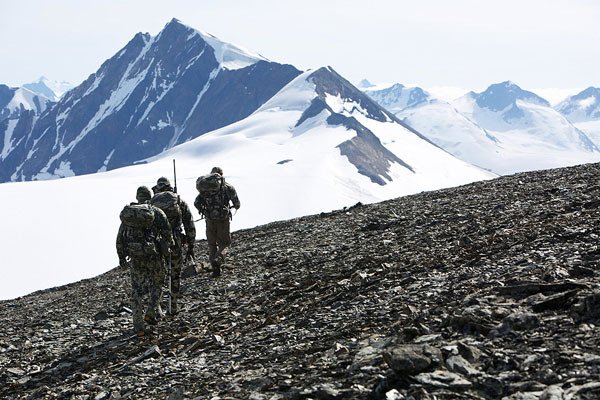 Ice Mountain was the most interesting place I have hunted in my lifetime. I could not understand why the rams liked this mountain other than there was no bugs; because there was not a lot of food, it was always windy, lots of bad weather, and it was for the most part totally inhospitable. It was a very special place to hunt for all of these reasons. These sheep are incredibly tough animals; I think about my ram spending the summer in this country and surviving nine cold, dark winters, hunted by wolves and Grizzly bears; The thought of his tough life in the north always makes me have the utmost respect. 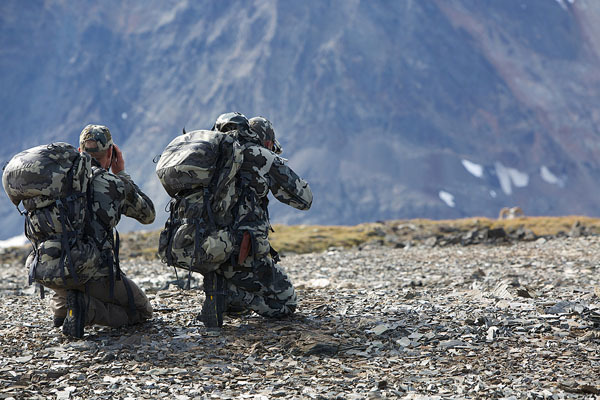 I feel beyond privileged to have the opportunity to hunt these animals and test myself in these mountains. This is a hunt I will never forget. Epic hunt Jason! Thanks for this awesome hunt report, the photos are terrific. 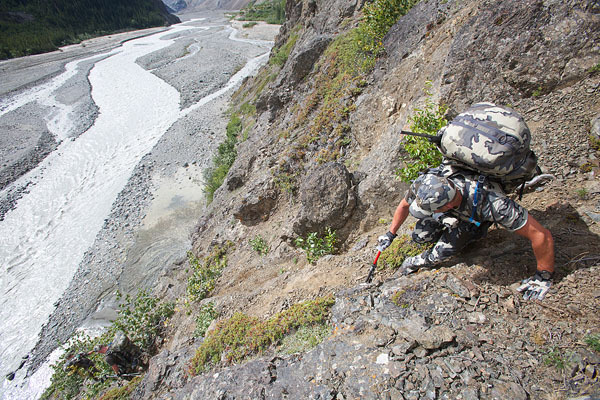 Can’t wait for Nahanni Butte again next year. See you there!! Yes me too! Thank you for the comment. Jason, were you able to get any digiscoped photos of “twister” you’d be willing to share? Also, what information are you able to share about the new tent? Looks like a really high ceiling on it. Will be interesting to see how it performs in high winds. Also, will it be available in 2 person? No photos of Twister. We shot video of this trip, that included twister but lost it with the bad weather on the hard drive. I should have shot it on a card. The tent performed flawlessly in crazy hard winds. 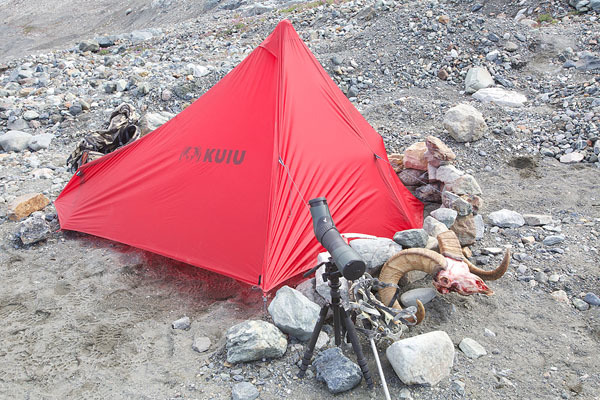 I was not expecting this tent to do so well in the type of conditions we encountered. No plans to make it in a 2 person. This type of design does not lend to a 2 person design. 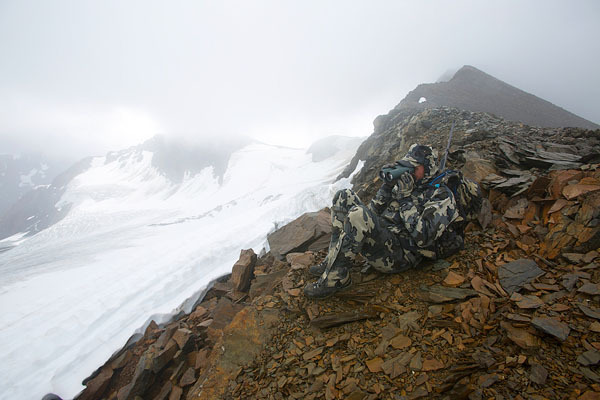 The most challenging hunts are embedded most deeply in the mind. 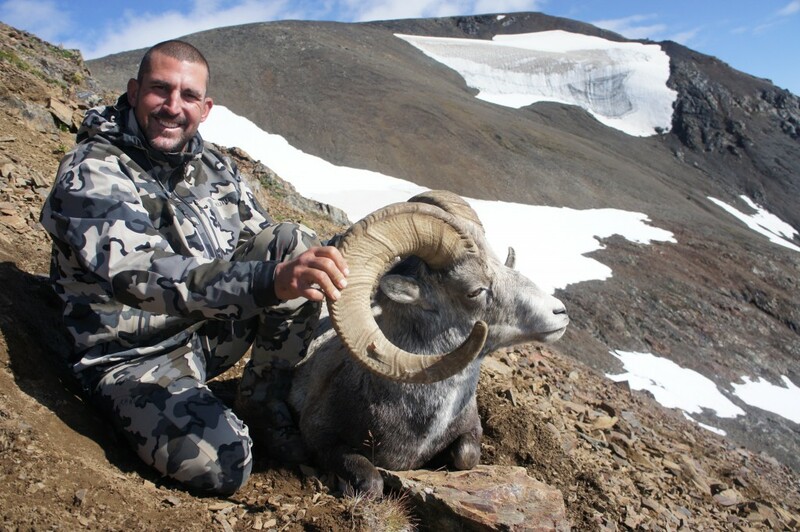 Congratulations Jason on an epic hunt with a great Ram and Billy! Well earned. Thank you for sharing your hunt and pics. Got my blood pumping! Awesome! Thanks for taking the time to comment Jack! Any news on when the Nuyarn socks will become available? Thanks for the comment Greg. Nu Yarn Socks are scheduled for November. 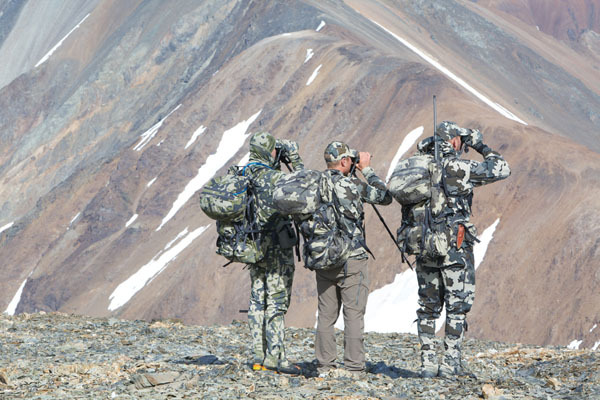 Looks like an awesome hunt! Congrats on that beauty stone! “Ice mountain” you call it. 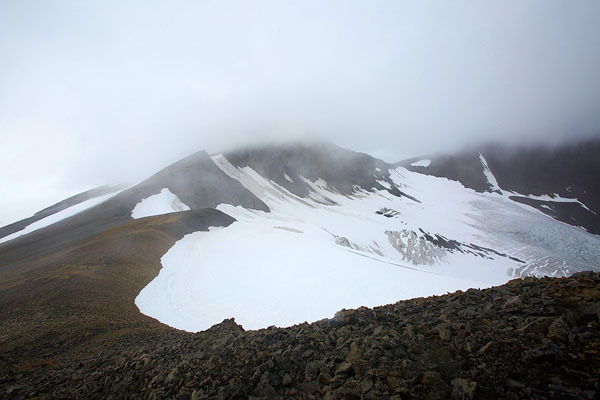 As in Mount Edziza? Jason, Many a Men have dreamt countless dreams of taking on such a challenge. I certainly enjoy your words and images of hunts I will probably never be able to attempt but, I too can dream. Right? God bless, and keep producing both quality gear and amazing experiences. P.s. don’t let Twister haunt your dreams to many nights! Ha Ha! Yes Twister will never probably leave my thoughts! Excellent write-up…Thanks for allowing me to come along. Beautiful ram Jason! 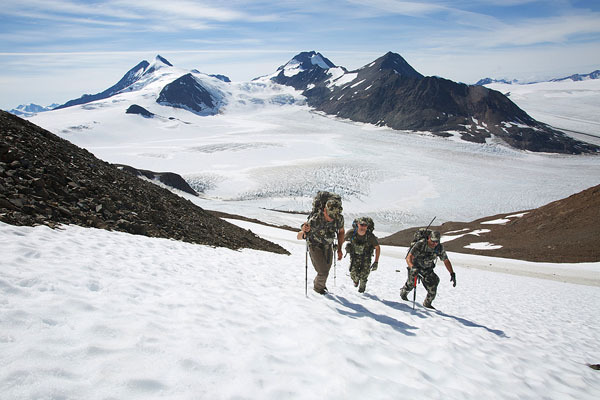 What was total cost with gear, rifle, glass, outfitter, airfare, food, etc? Thanks Kent for the comment. Fan-freaking-tastic Doode!! What an awesome adventure! Paul Bride killed it with his photography! I am psyched to see all the new product prototypes! Keep it up mane! Yea, pretty simple and useful design! It worked really well. Wow. Congratulations. What a spectacular adventure. Thanks for sharing Jason. Excellent writeup and photos. 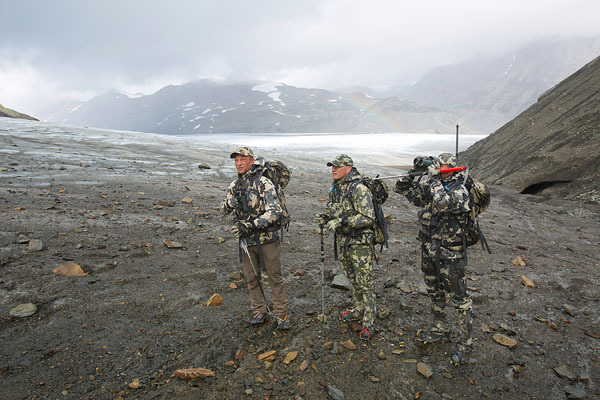 Thanks for sharing your hunt with us and congrats on a successful journey. Thank you for the kind words and comment. Jason, you’re living the dream! Congratulations on such a fantastic sheep. The story and photos were phenomenal. 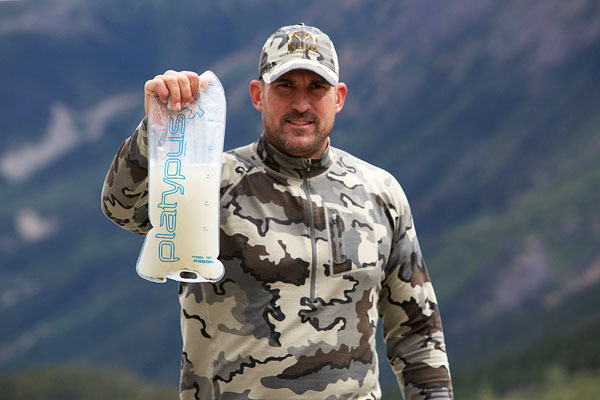 Thanks for being the leader in product development for the outdoor industry. Luv the gear! Thank you Bob, I appreciate it. Thank you for sharing your amazing hunt with us. It’s always fun to see other peoples adventures. Also thanks for sharing your gear list. It’s nice to know how you utilize your own equipment. Following this made me realize how tough I am. Elk tough and high country mule deer tough. Not stone sheep tough! Very unique hunt Jason. Congrats on persevering and coming home with a fine stone ram. Wow , major adventure . I appreciate the comment Jon. Phenomenal adventure! Thanks for sharing and congrats on the awesome harvest! Well noted. Thanks for the comment. Great sheep! What a fantastic hunt and an entertaining read! 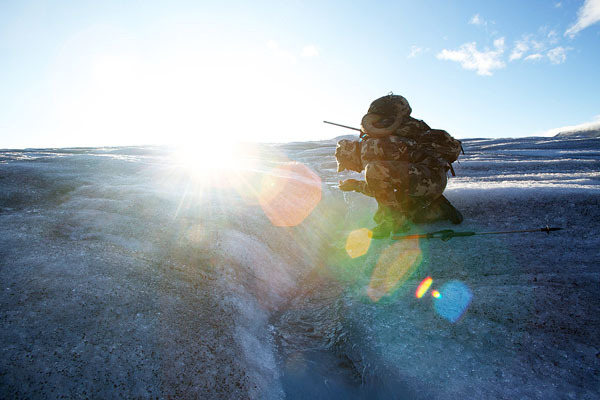 Always look forward to reading the Kuiu adventures,… Yours and Brendan’s… Inspires me to get out there! 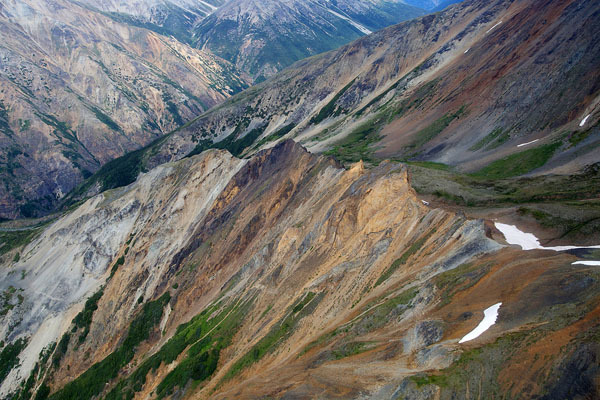 Stones next year, maybe, but BC Bighorns and Goats later this month. Thanks for sharing! Thanks for posting your gear list. 44 pound pack, including food for 10 day mountain hunt?! Sign me up!! Epic story. 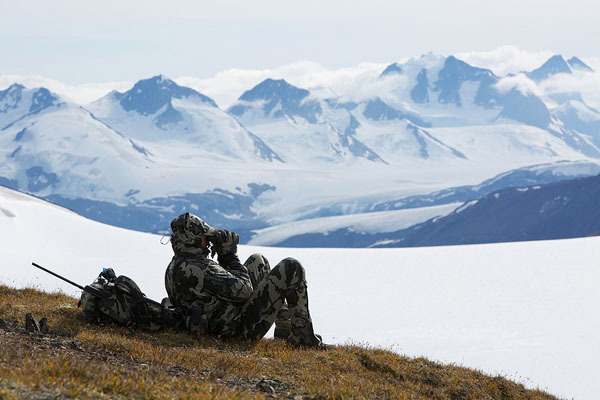 THIS is why we hunt. It’s too bad you weren’t able to film your hunt; it would have made an amazing movie. 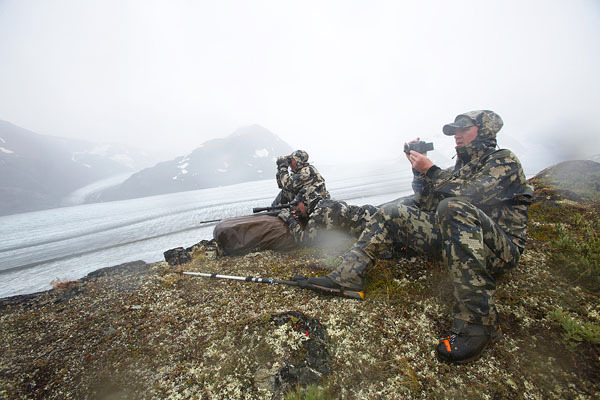 We did film this hunt and lost the footage on the hard drive due to moisture. It was amazing footage! Awesome Jason!! Looks like a hard hunt for sure and I’m glad your adventure had a successful ending. Beautiful Ram!!! 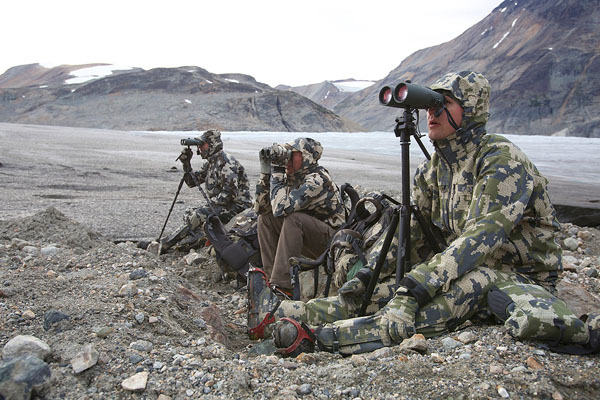 Did you mainly wear the Yukon gear? 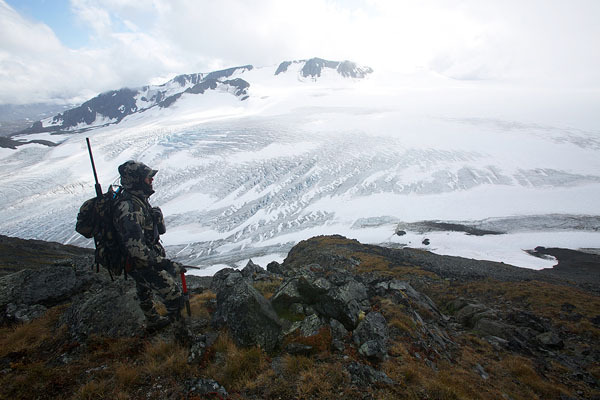 I wore Yukon Jacket and Chugach Pants and Yukon Gaiters for this hunt. I would have worn Yukon Pants but we were out of stock when I left for my trip. Thanks for sharing Jason!! Super stoked for you !! The photos were awesome! Thanks Cory! See you next week. I really appreciate the gear list. If you have time at some point, I’d love to see a video of you loading everything up for a long day’s hunt. Thanks John. I will shoot that Video for you. It’s great to see that we can get ten days of gear in under 50 pounds. 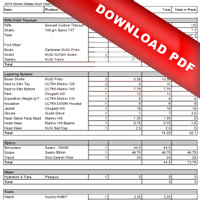 I really liked the packing list spreadsheet. I had one question though…where do you get 190 grain 300 WSM ammo that only weighs half an ounce per round? I would think they weigh more than that. BTW, my ICON 6000 is still going strong and remains my go to pack. Thanks Larry for the comment. Glad to hear the pack is still running strong for you. 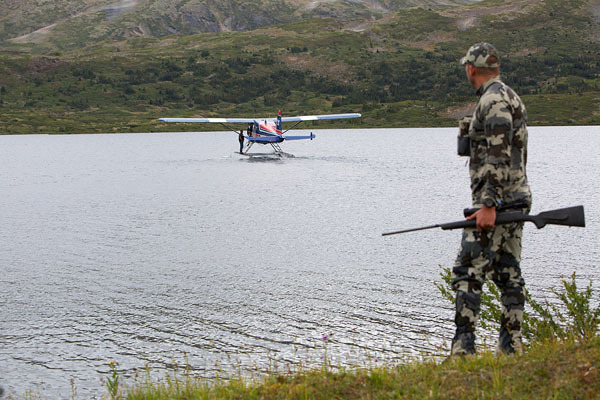 Now that’s a real sheep hunting adventure Jason! Going to be hard to top that, and I bet it was tough going back to the day-to-day. 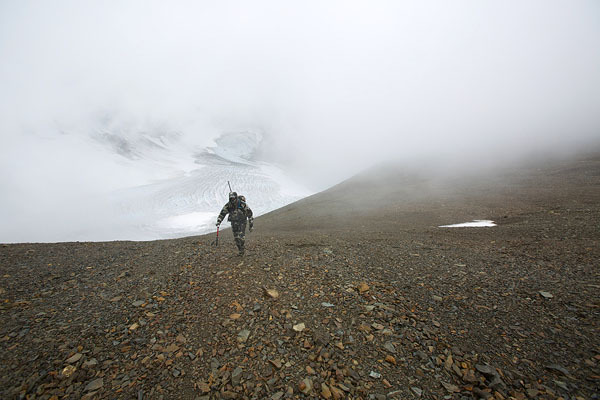 Fantastic pics and also one great stripped down gear list. Congratulations! Thank you Paul! It was an incredible experience. My leather sheath is a custom Knife I carry by a knife maker named Scott Cook. Brendan’s pouch is a prototype accessory pouch we were testing. It was really fun to read your story and look at the amazing photos. I really appreciate the blog posts like this, and also appreciate the gear list. A few questions about the gear list if you don’t mind. Could you list what you carry in a 1 oz first aid kit? 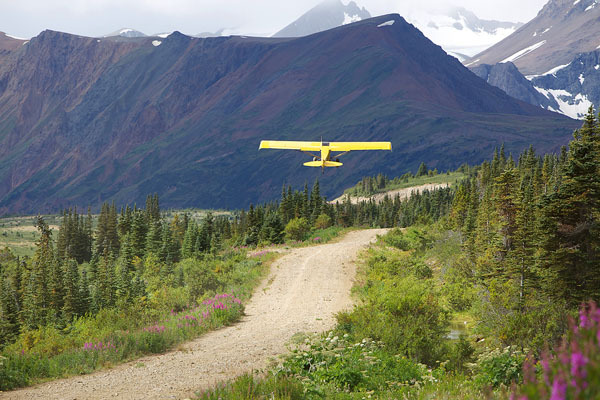 No game bags, rangefinder, stove, fuel, spoon? 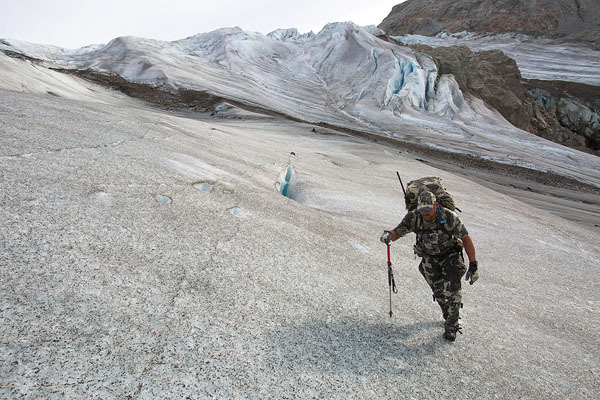 Is the ice axe the same as the 7 oz trekking pole you list? 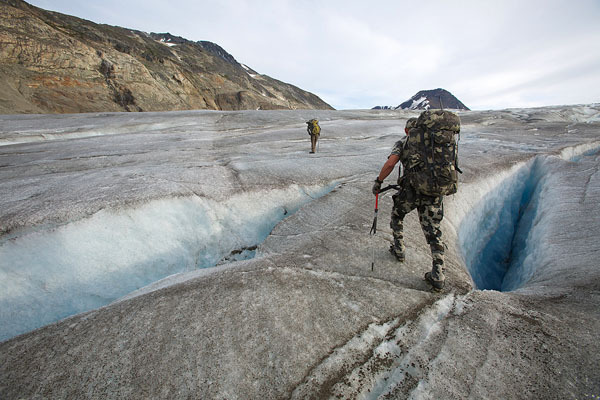 Yukon jacket and crampons not accounted for? Not trying to put you on the spot, but I’m trying to learn how to minimize my own gear. 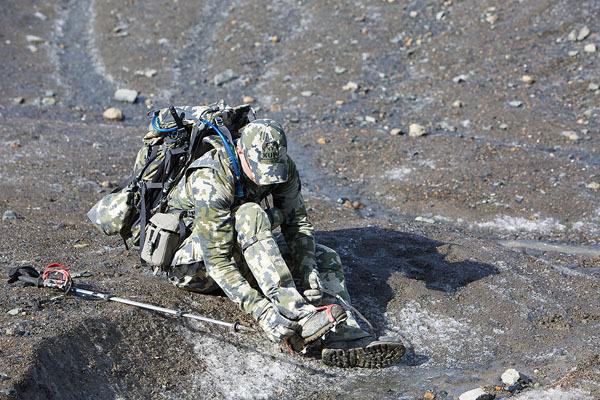 I can see that due to the terrain and location, a lot of things on my gear list would be useless, so I could leave them home. 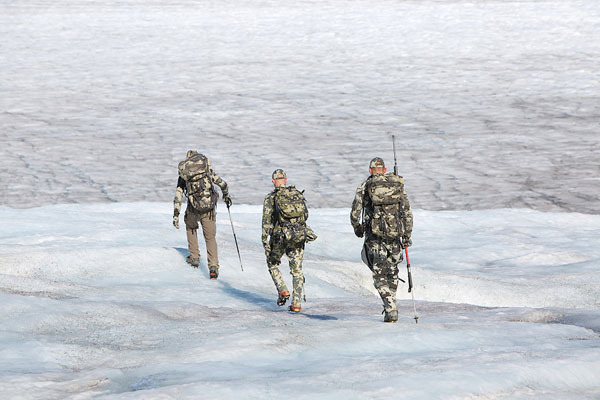 The guide carries the stove, fuel and game bags. Spoon was included with my food. But I guess I should have listed. 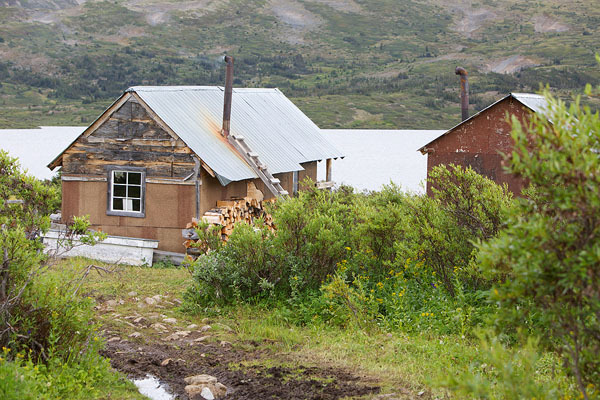 I switched out at the last minute to a Yukon Jacket and forgot to change it on my gear list. Crampons were not on my list but I should have included them. Thanks for noticing. I will get them changed. Thanks a lot for taking the time to answer my questions. 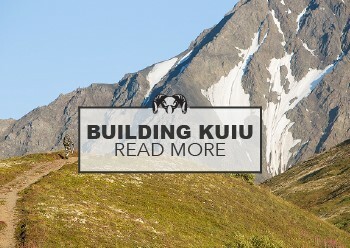 Looks like some awesome products may be coming from KUIU in the future. Congrats on two nice animals! An awesome adventure! Thank you for sharing it with us. 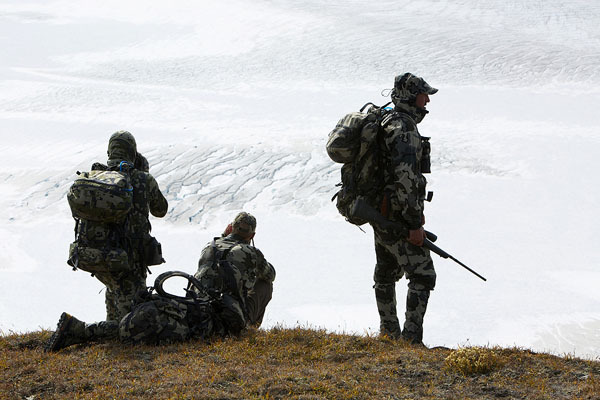 It makes me proud to be a member of the KUIU family. Thank you David. 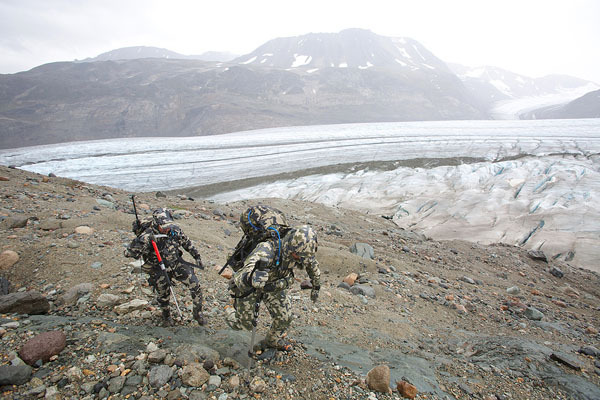 Glad to have you part of the KUIU family! Another amazing adventure, captured perfectly! Great job and congrats on the trophys!! Love the gear list and can’t wait for the new products that will come out of the protos. Very excited for all the new ultra products. Great story. Epic hunt. Thanks for sharing. Great write up Jason. I to want a Stone Sheep more than any other animal. 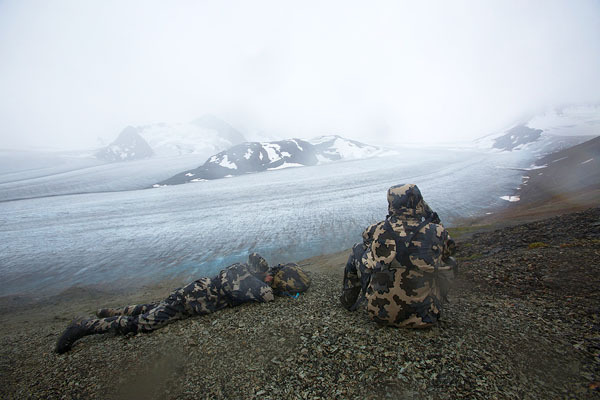 You guys really dealt with some crap weather but the KUIU gear kept you guys dry and comfortable..
A picture’s worth a thousand words. I loved spending time scrolling through your story. Congratulations on an incredible hunt. Other than being an NFL vet and being a beast, what kind of things did you do to get in the kind of shape a hunt like this necessitates? What an incredible hunt. 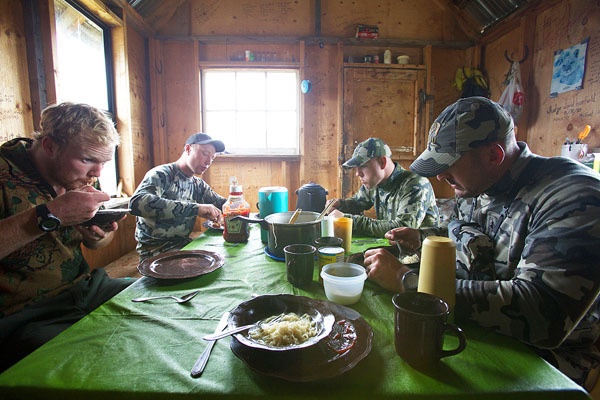 I absolutely love reading these hunting stories, especially in places I have never had the opportunity to go. Thanks for sharing Jason! It’s awesome to see what the gear can go through. Is there any reason you took the Icon Pro instead of the Ultra? Hi, Jason! 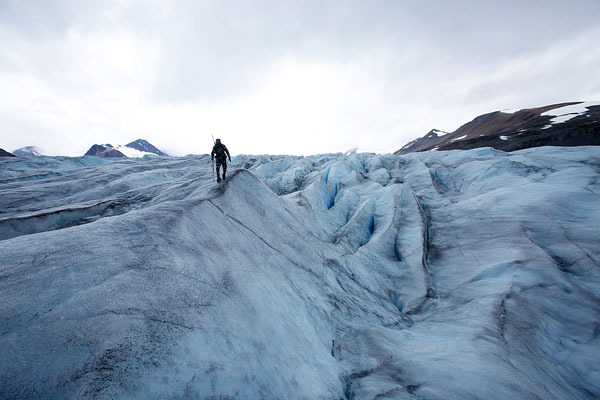 Outstanding photo chronicle of your incredible trip! 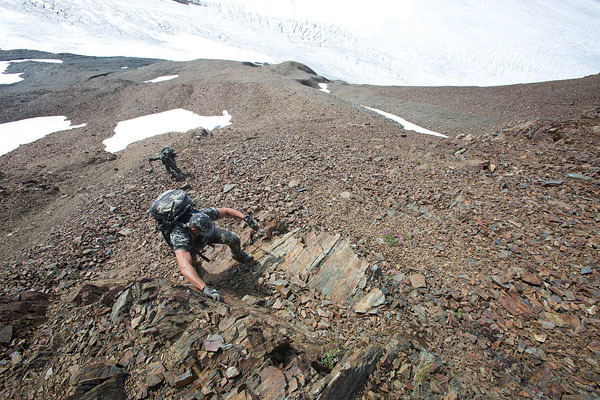 As you said, the descent down some of those steeps must have been challenging to say the least! 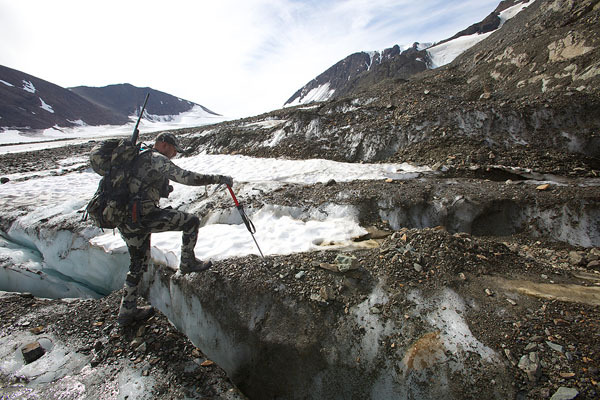 Who manufactures your ice axe with the tele shaft? Thanks. 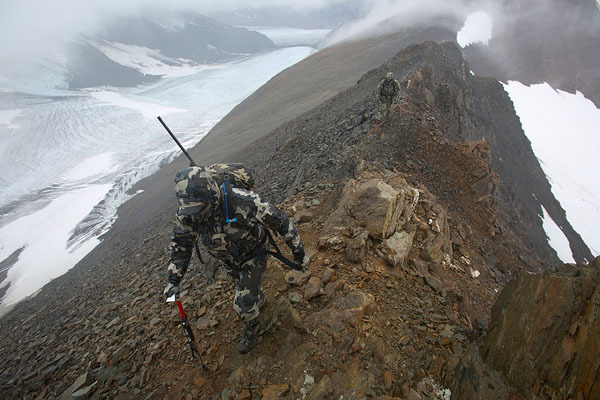 Stubai is the manufacture of the Ice Axe I use. 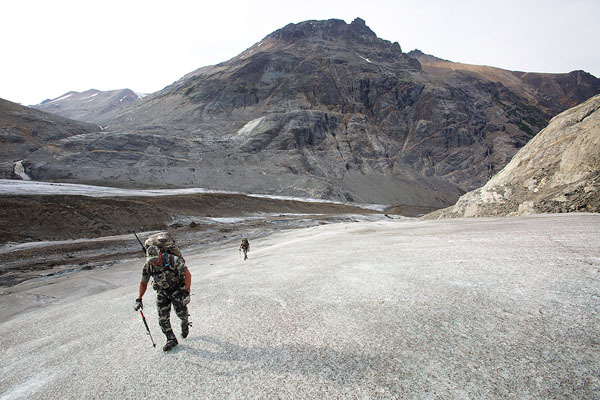 It is a great mountain tool to carry even when not in ice. I admit visiting the site every day, looking for your story, and I have not been disppointed… What a phenomenal hunt, Jason, my most heartily congratulations. And I can’t wait to learn about those protos! Alvaro, thank you for the nice words. I always appreciate it my friend. You stated that Brendan was there to “hunt goats if he had the opportunity”. How come he didn’t get the nod on the goat? He has already shot goats and he wanted me to shoot one before he did. We just never had another opportunity. 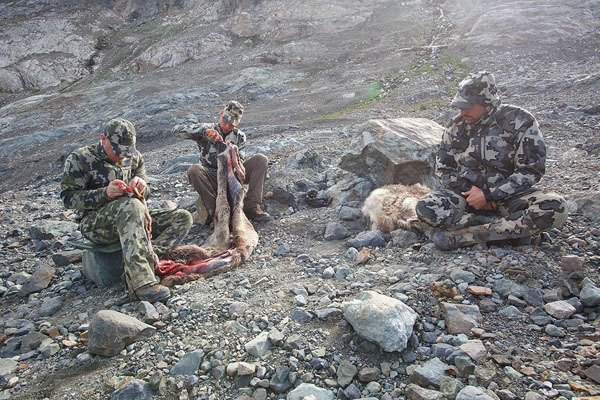 I am new to the Kuiu site, and was reminded about it by my buddy Clay Colwell whom I hunted sheep with in the Yukon in 2012, who has quite a bit of your gear. Amazing visuals via such fine photography. What an adventure!! My hat’s off to you and your crew for such an inspiring story. 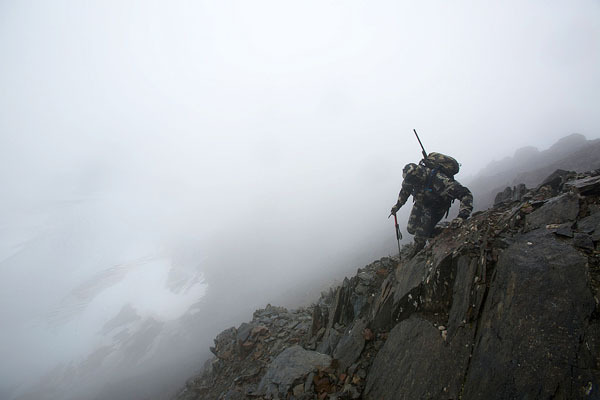 Nothing is finer, IMHO, than reaching the peaks with your own two legs and being in the realm of the mountain kings. 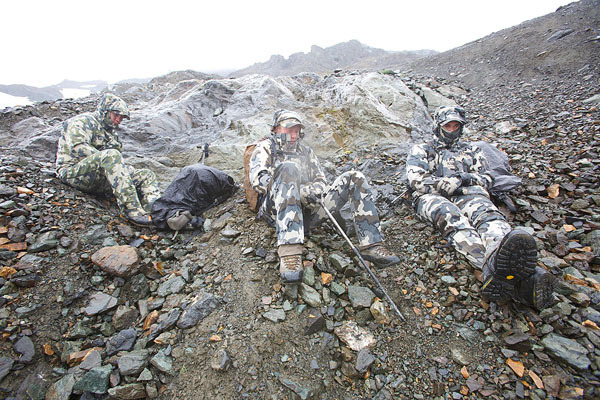 Truly a spiritual and “rebirth” experience, as the appreciation and elation, mixed with a bit of sadness and respect, makes mountain hunting such a Zen experience. Well done and congratulations! 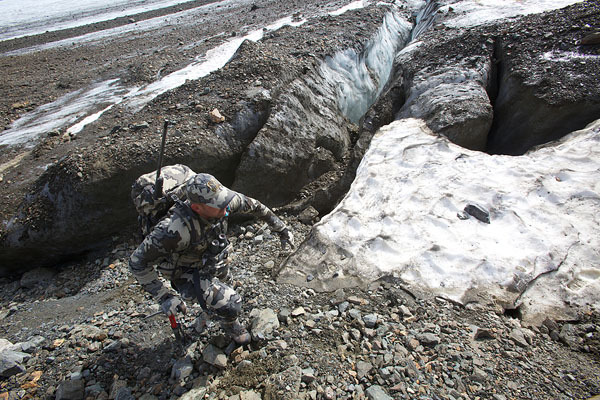 I may have to replace some of my well-worn gear with some Kuiu creations! Really well stated Gordon! Congrats on your Stone, it sounds well deserved. 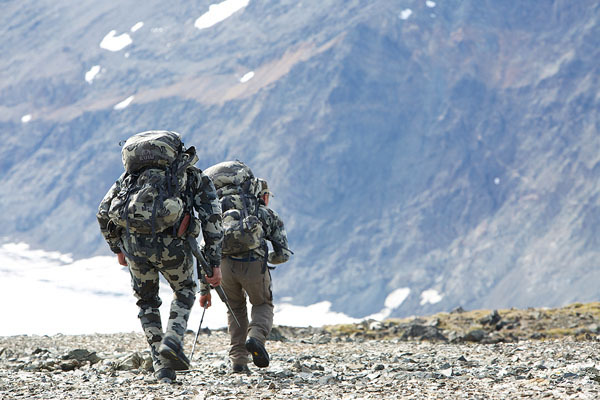 I would love to have you as a KUIU customer and part of the family. Let us know if you have any questions on our gear. Awesome hunt and pictures, congrats on an awesome ram and billy. Can you give any info on when we will see more about the ultra star tent? We are still in the testing phase this fall. If it passed our testing it would be available this spring. So far it is turned out to be a fantastic design and tent. 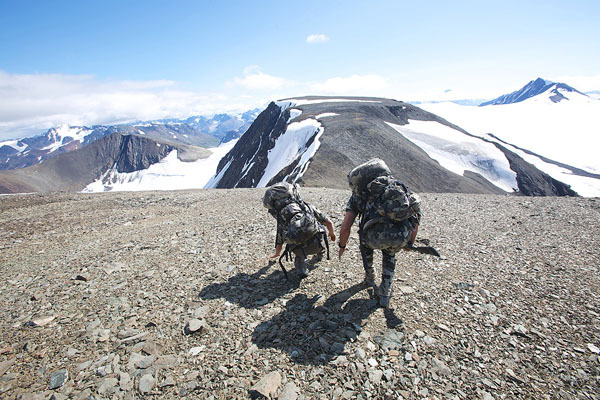 Jason – I’ve enjoyed reading and visually experiencing all your prior adventures up to this point, but this latest Stone’s sheep hunt takes it to another level. 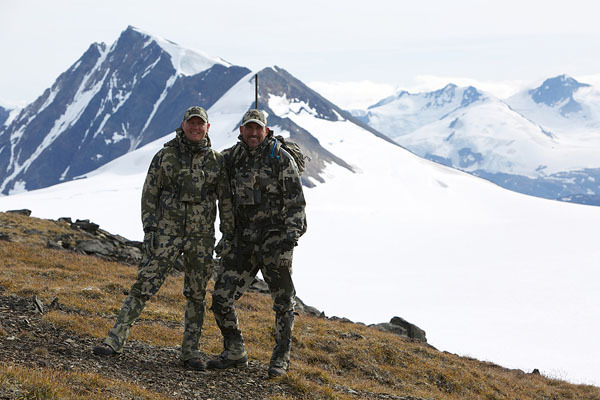 Congrats on not only a great hunt, but for having created a company that does exactly what’s needed in the most challenging conditions such as those you faced. We all benefit from it. I see on your gear list that you were wearing a proto boxer. Any hints on the what’s and when’s of this product? I’m hoping for a merino product. These and the new socks will be a great and much needed addition to the lineup IMO. 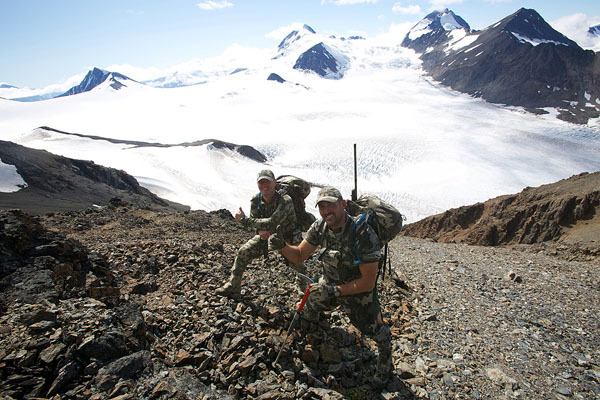 Great story and detailed account of a typical hard stones sheep hunt up here in BC! 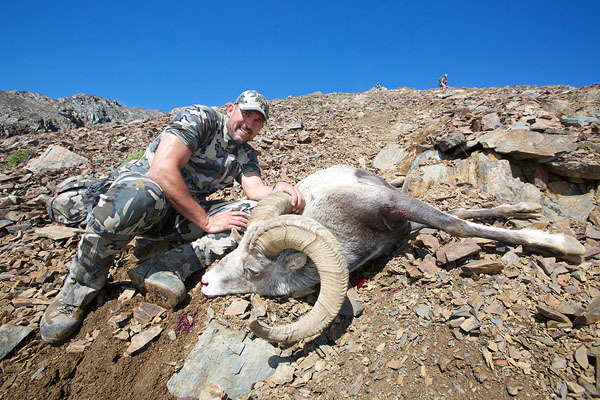 I see the Stones sheep gods don’t make any exceptions with allowing rookies to the area the luck it takes to score a large ram on the first hunt! 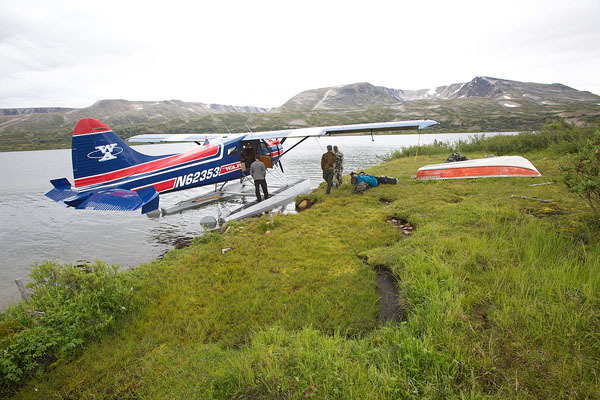 Despite the epic effort….it usually takes a few trips. Did you have to whack any brush? 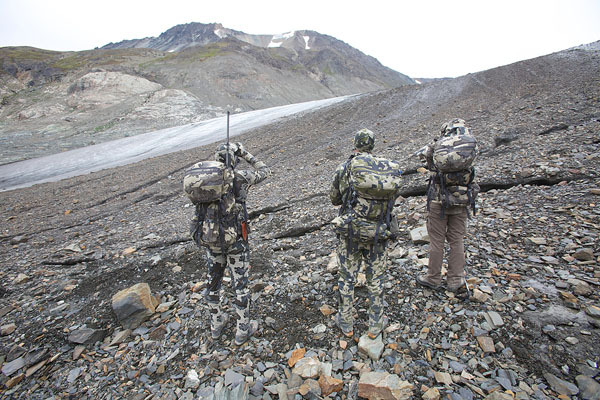 The big question a lot of fellow BC sheep hunters have about Kuiu gear is whether or not it will stand up to serious bush whacking that is normally required on hunts up here. Cheers! keep up the great work.. Thanks Jeff. No heavy bush wacking on this trip. Glacier Country kept us out of it fortunately. My first Stone Sheep hunt when I was first developing had days of it and the gear held up perfectly. You bet! 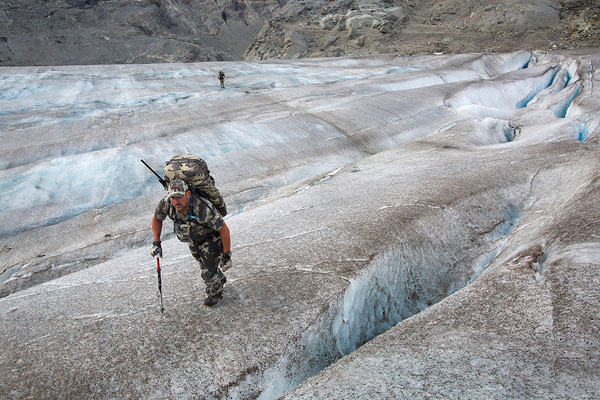 I’ve been impressed with all the gear I’ve purchased from you guys….no problem there. Many thanks for posting your story and photos. I knew it was coming and have read it thru twice. Undoubtedly both mentally and physically demanding. 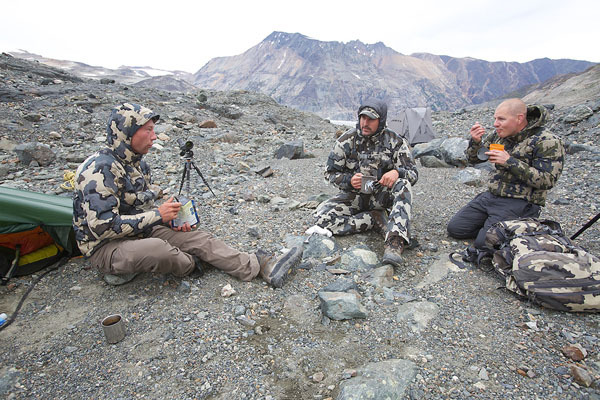 I am wondering what the reasoning was to pair the Yukon jacket with the Chugach NX pants? Also any ‘release date’ for that proto Star single person tent? Hey Jason. Great to see my buddy Greg and his son Blake. I should have know a great guy like you would have found the Williams and have had such a great hunt. My son Will and I hunt there next season of course I can’t wait. But very glad for you and your crew. Please say hi to Brendan and Paul for me. 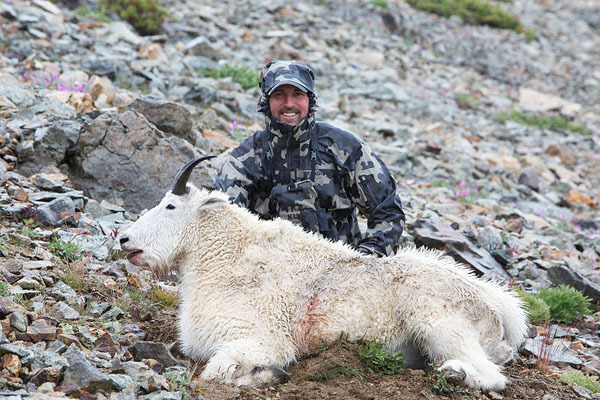 Use your gear lots and it always keeps me warm and dry congrats on a great ram. Gord. Brendan has shot several goats and wanted me to take my first and he would take the opportunity on a second goat if the chance presented him. I offered him the first goat several times and he would not accept it. Hey Jason,thanks for responding back . You have a true friend in Brendon. Both of you are living the dream I day dream about every day . It must be awesome . I will get there as the saying goes ” One Day”. I hope soon !